If you have ever wondered in the woods in the fog, you will find that everything has a mystery all its own. 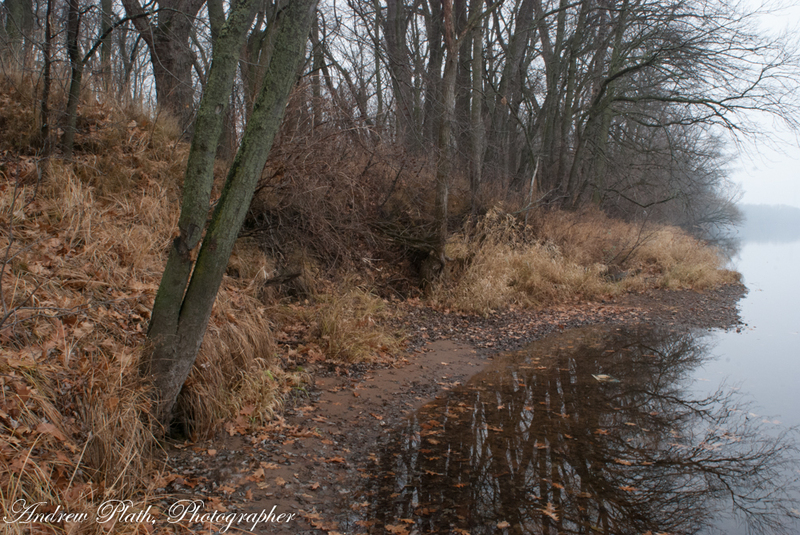 On a foggy day, I set out to walk one of the lower trails in Rib Mountain State Park near Wausau, WI An eerie stillness is set in the woods when one can only see the blazes that mark the trail and make out a haze. You don’t know what can be around the next corner, or even why. Will you see deer or stumble into a bear or what? That is the mystery. It made a good chance to experiment and explore with my D-80 and a few lenses to see what can’t be seen and what can be. 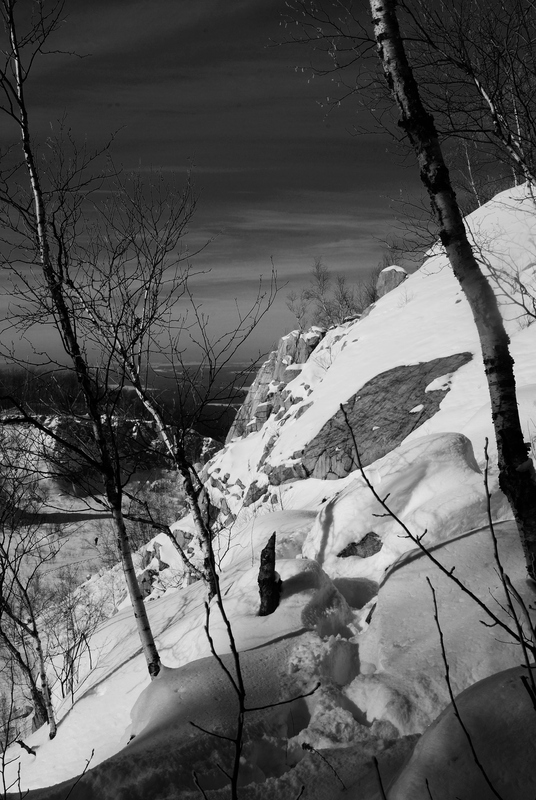 Rib Mountain is not a true mountain in a sense. It is nowhere near like the 14,000 or so high peaks that make up the Rockies, the Tetons, or the Bitterroots. It is not even like any of the Appalachians. Yet we call it a mountain here in central Wisconsin as it is one of our highest peaks and it does affect weather to a degree. It is always a few degrees cooler than in the city of Wausau itself. Rib Mountain may not be a true mountain, but we can call it our mountain. It has a cragginess of its own. I took this photo awhile back. Today I hiked up there again after work. This is a solitary place full of breathtaking views. It is a challenging hike to get there but a good one. On this day there no haze like this photo shows. Only breathtaking clear sky. Places like this, although it is man-made, it can be a place for worship and prayer to be alone with nature and with God. 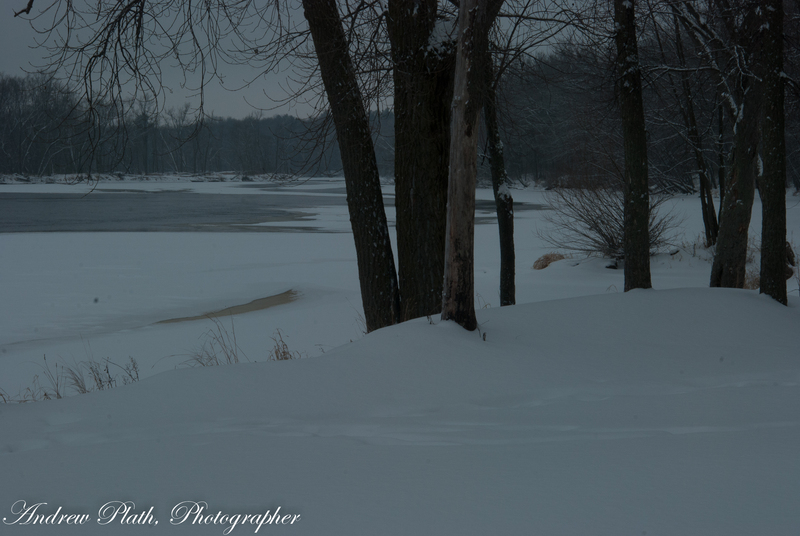 It is one of my favorite places and, truly a hidden gem for Wisconsin. It looks like a huge gash in the mountain from the distance, but it is not all that bad. A worthwhile place to see and experience. 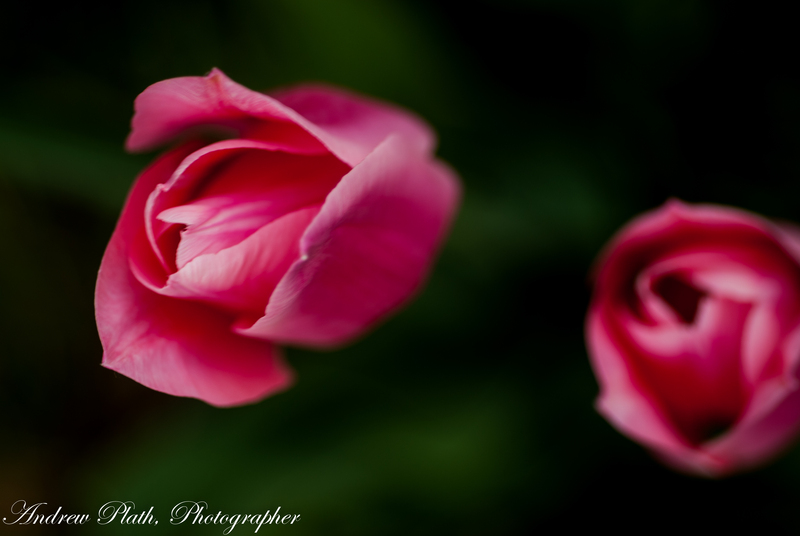 It is amazing to me as to what others see in my images. 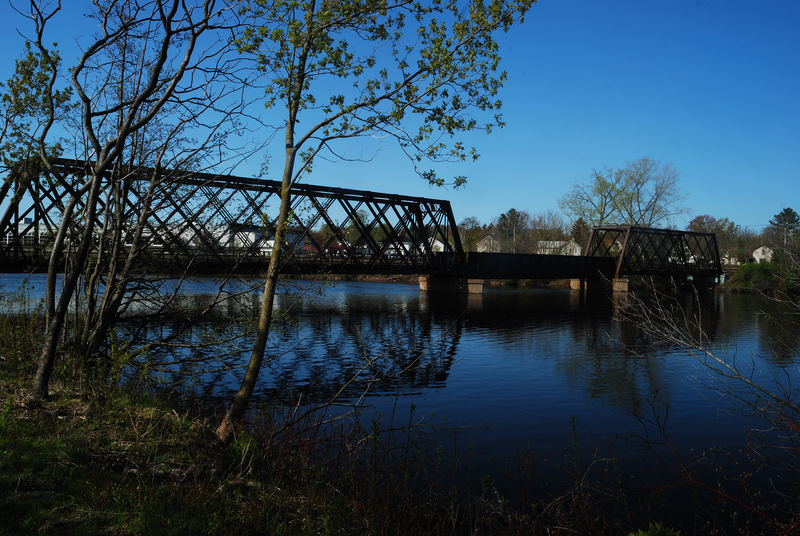 Here I photographed this bridge as I have many times since it was converted from a railroad to a pedestrian bridge. 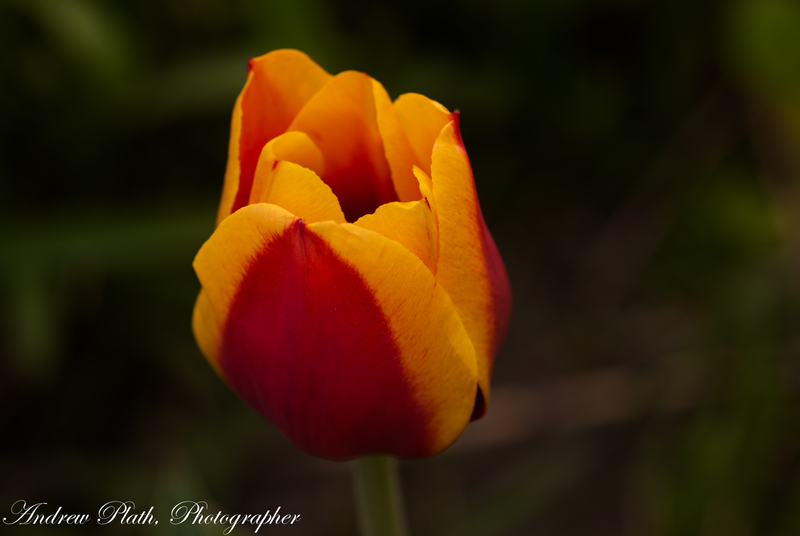 Like all of my images, I start shooting in RAW and in color. The day lent itself better to black and white. 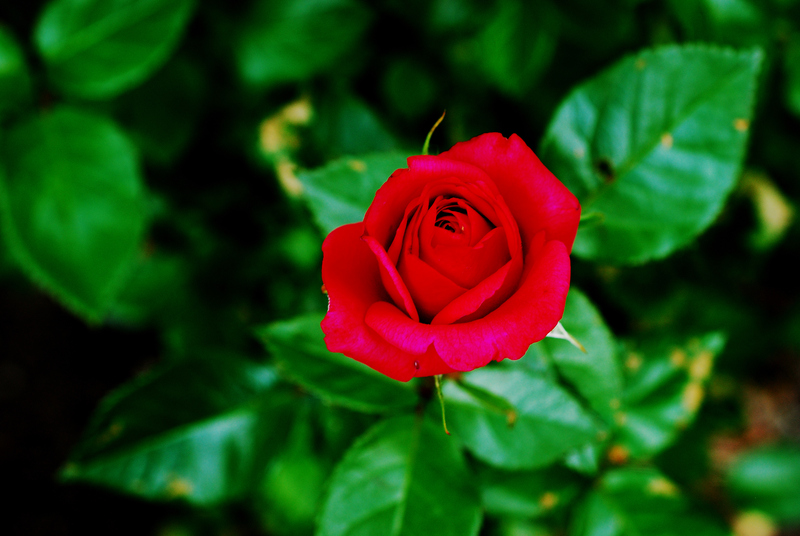 For that, I went into post-processing and used the wonderful tools in Adobe Lightroom 4. 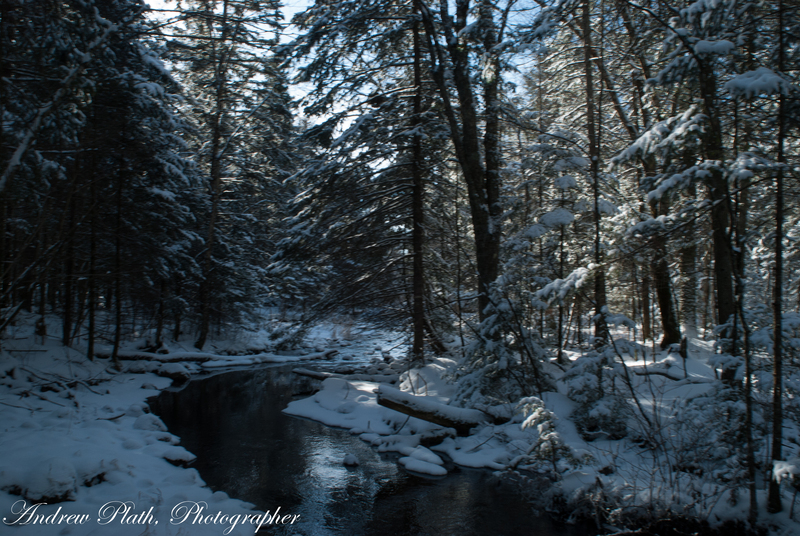 Some photographers dislike Lightroom, but I have grown to love it. In Lightroom, I converted this image from color to black and white and made a jpg copy with all the keywords for search engines to guide people to this image and this and other sites that I might have it uploaded on. The picture says winter is here! Here we are looking west towards Barker-Stewart Island on a dreary December Saturday. Even on dreary days, nature provides us with something to see. 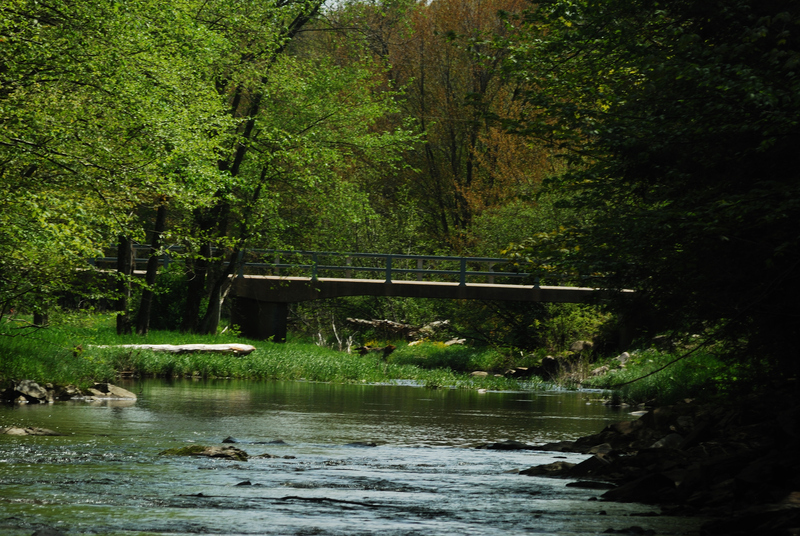 A historic landmark bridge awaits to take riders and hikers across the Tomorrow River near Amherst, WI. 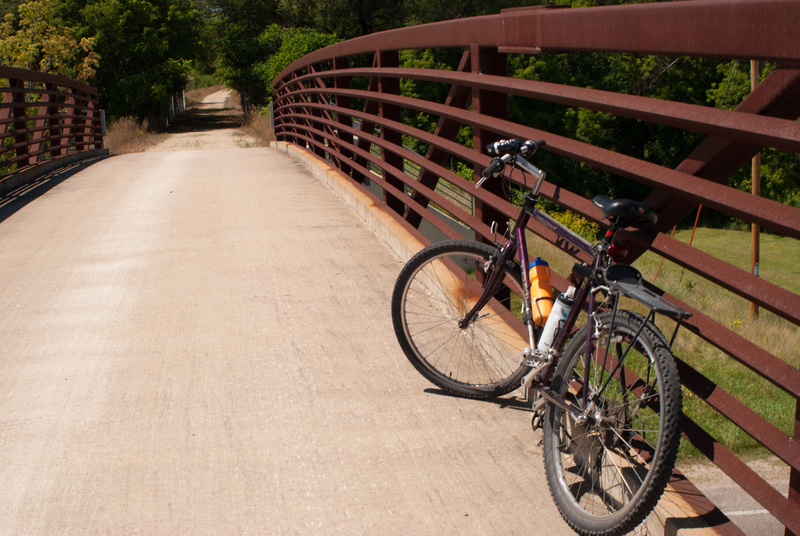 On a whim and a fancy, I decided to take a chance on one of Wisconsin’s newest state rail-trails. I had known about the Tomorrow River State Trail for a number of years. I “fell in love with this bridge at first sight. 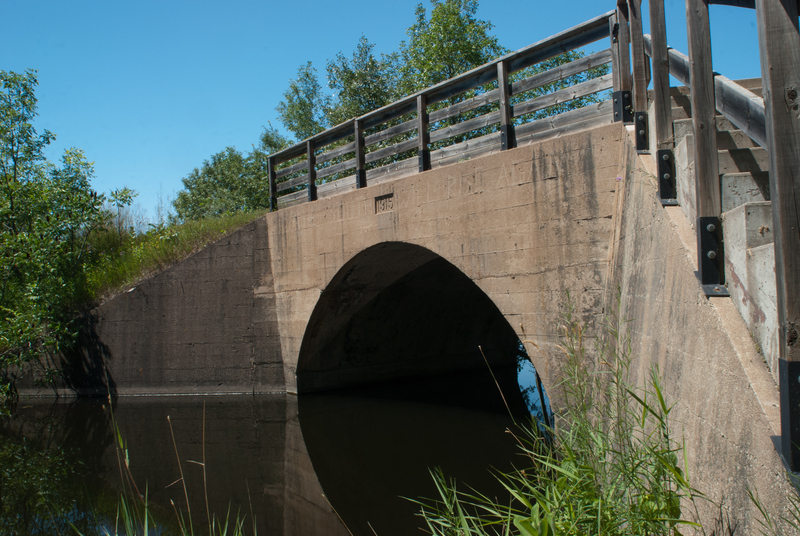 This is the concrete arch bridge that crosses the Tomorrow River, a well known trout stream in eastern Portage County, and for me, a key as to what this trail has to offer. I could have done a full trail ride, and maybe I will soon. The Tomorrow River State Trail begins at Hoover Road in the Village of Plover and extends eastward for 34 miles to Manawa on a former rail line once operated by the Green-Bay & Western Railroad https://en.wikipedia.org/wiki/Green_Bay_and_Western_Railroad. I chose to just ride the section from Amherst to Ogdensburg for a number of reasons. For one, I made some stupid mistakes the last time I tried riding out from Plover (like forgetting the front wheel of my bike). The section between Amherst and Ogdensburg proved to be a scenic gem. 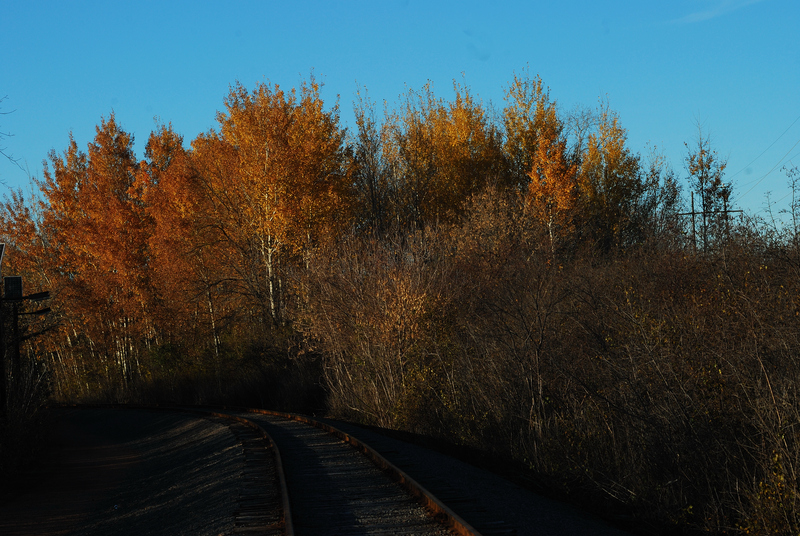 I carry a backpack laden with a DSLR and several lenses whenever I ride a rail-trail. I have come to know that each of Wisconsin’s numerous rail is going to offer up some of the best scenery. On a bicycle, and especially on a rail-trail, it is not so much about “getting there” as for what you find along the way. The Tomorrow River Trail passes through glacial moraine giving riders a scenic, but rugged, landscape to pass through on a gentle 3% grade at best. You will find many large boulders called erratics. Many of these boulders were deposited by ice age glaciers. It even becomes a journey through time as you pass through land that railroad locomotive crews once saw as a part of their job. 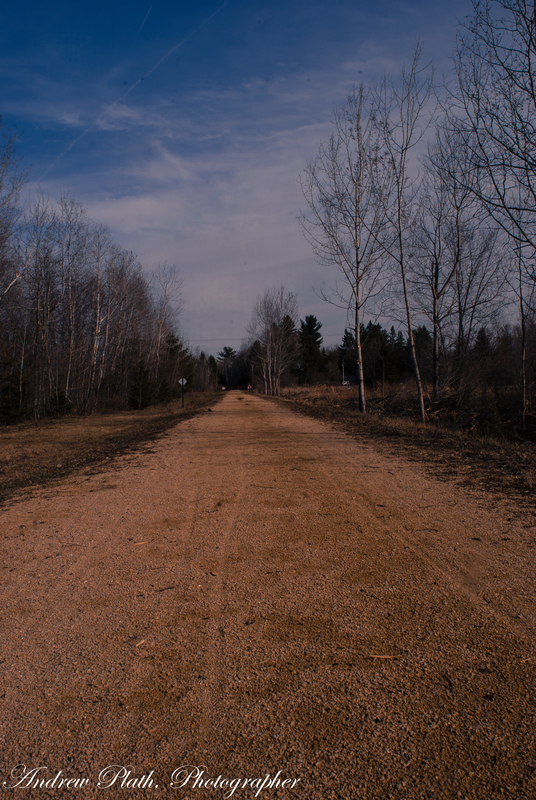 Like many of Wisconsin’s rail-trails, The Tomorrow River State Trail is paved with crushed limestone and can get a little grassy in places. 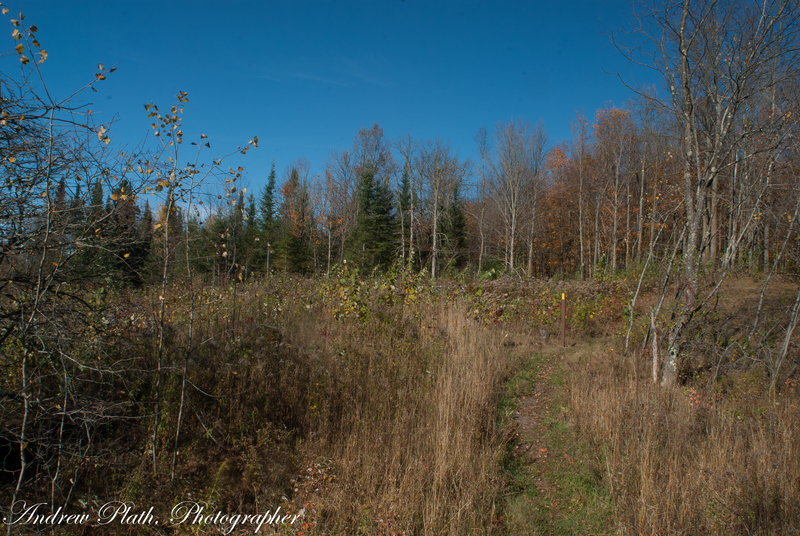 There is an equestrian trail along side in most places in Portage and Waupaca Counties, so you don’t have to run into horses and goo for the most part. It is a gorgeous journey so get your trail pass and take a ride. Highway 49 Overpass at Scandinavia. A view from the bridge looking upstream. I have often ventured in to Mosinee on a number of different occasions throughout the year. 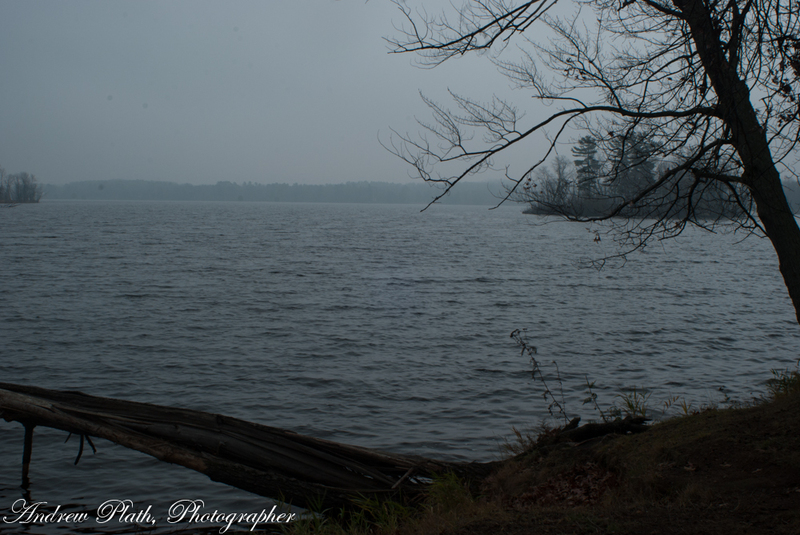 Most of my readers might have seen my other blogs like Mosinee in the Mist. 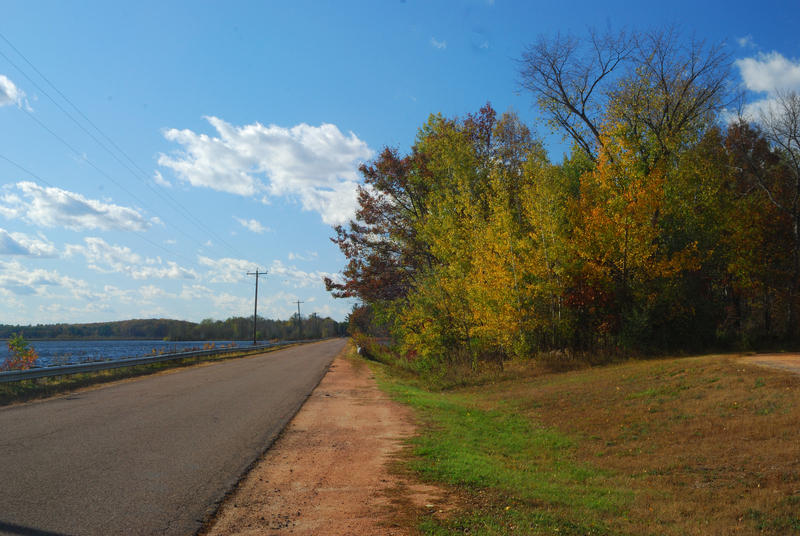 Mosinee has more frontage on the Wisconsin River than many of the larger cities like Wausau or Stevens Point. The river adds character Mosinee. With Mosinee Papers now known as Expiron, this city is a mill town. 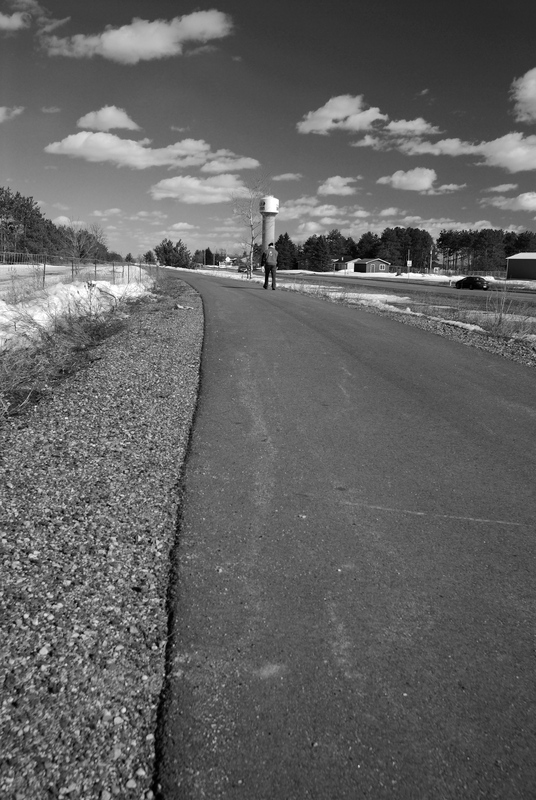 It is the southernmost community in the Wausau Metro Area and it is on the Metro Marathon County bike route system. I ride with my eyes wide open. I can see things that others miss. 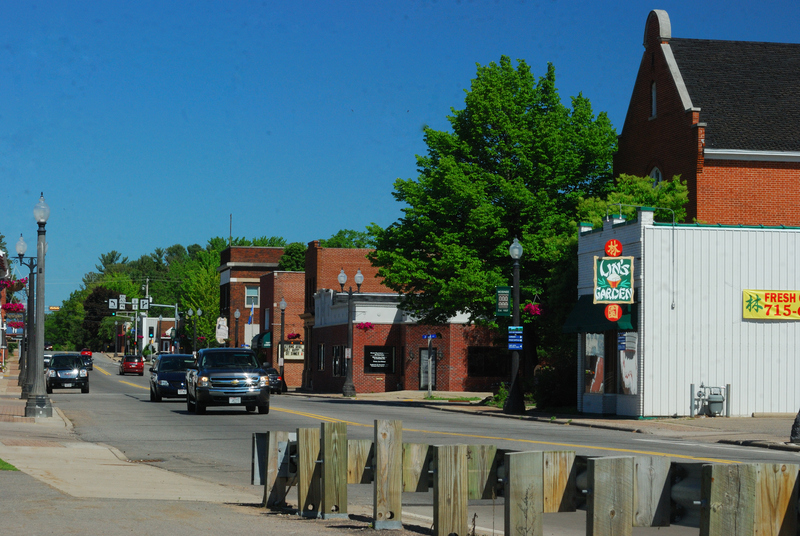 Mosinee struggles with attracting customers to local businesses in its downtown. For too long, it has been seen as place that you just have to go through to get someplace else. State Highway 153 is often seen as a route to get from the interstate to places like Marshfield. There is a lot right here for people to stop and explore. So get out, check the shops out. Spend some time in beautiful Mosinee! The winter here in Wisconsin just does not want to stop. 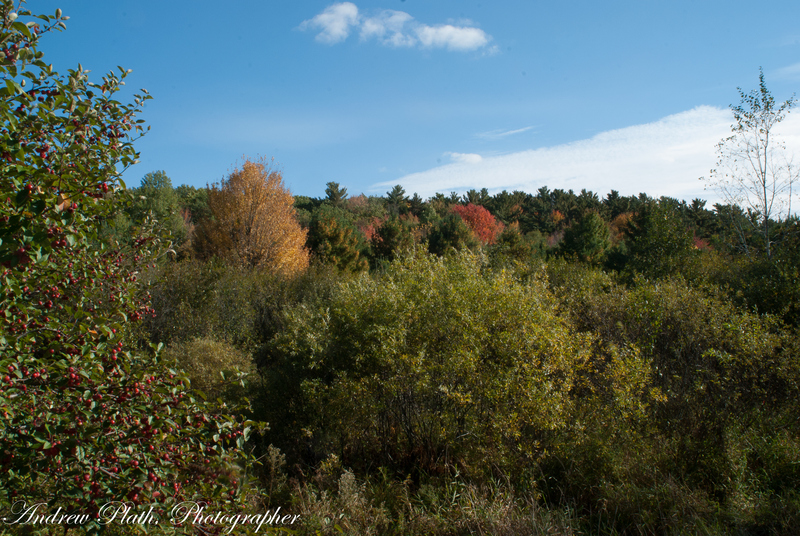 Last Saturday, I found some time to get out and check out the conditions of the Mountain- Bay State Trail. Unfortunately, I did not have the time to get out there with the bike and start to build my distance. Rail-trails offer a chance to travel more slowly off the highway from community to community while seeing nature at its best of all time. As the webmaster for the Marathon County Friends of the Mountain-Bay State Trail group, I get to promote all this to the public. 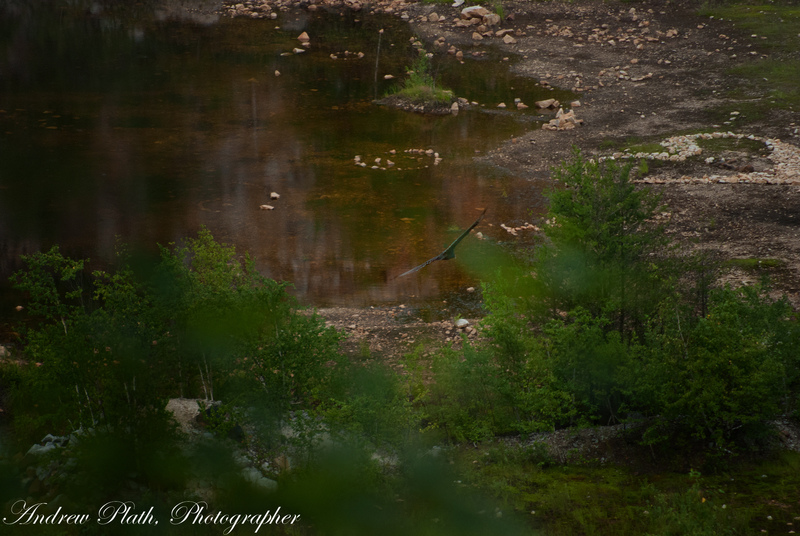 I also get to do the photography and having a good high resolution DSLR helps. 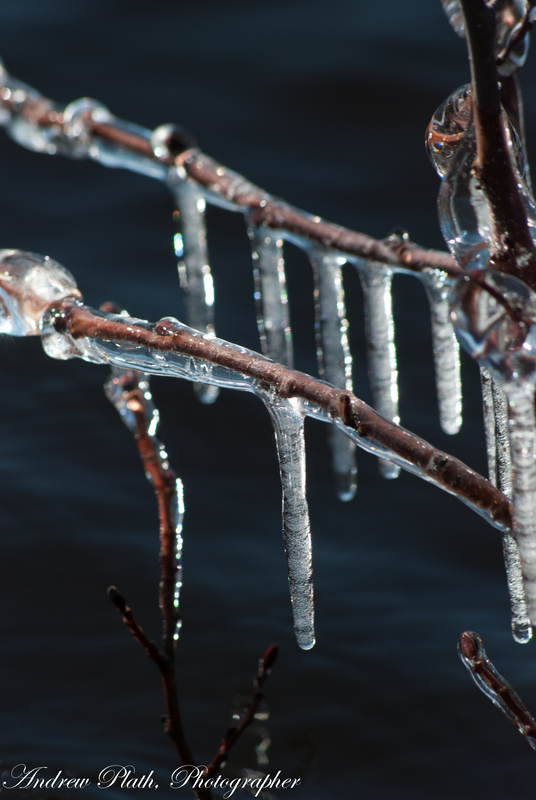 Late winter storms can be hard on people with the amount of ice, but then ice adds its own sense of art work. Here along the River Edge Walkway and in Oak Island Park in the City of Wausau, WI along the banks of the Wisconsin River,we see what nature has done with trees and shrubbery. 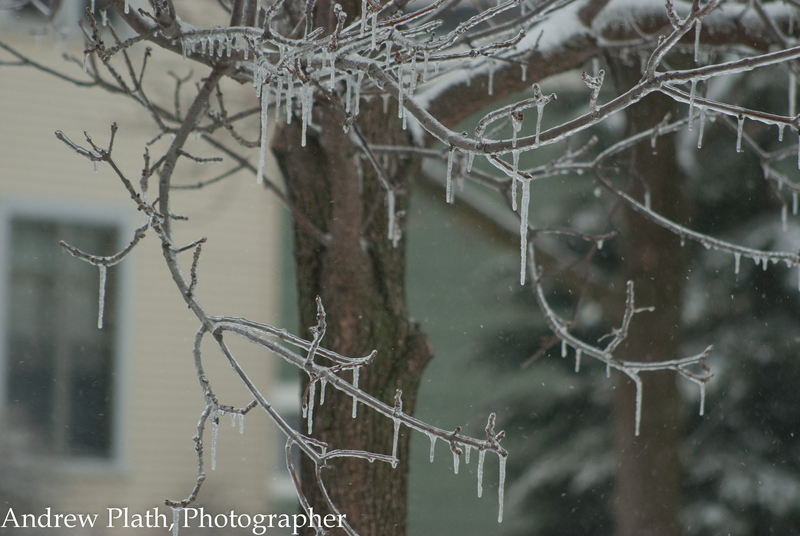 Many trees around Wausau were covered with ice on Saturday Morning. People woke up wondering if it really was April 4, or were the calendars wrong when they saw the slippery glass-like coatings on everything. This is nature. 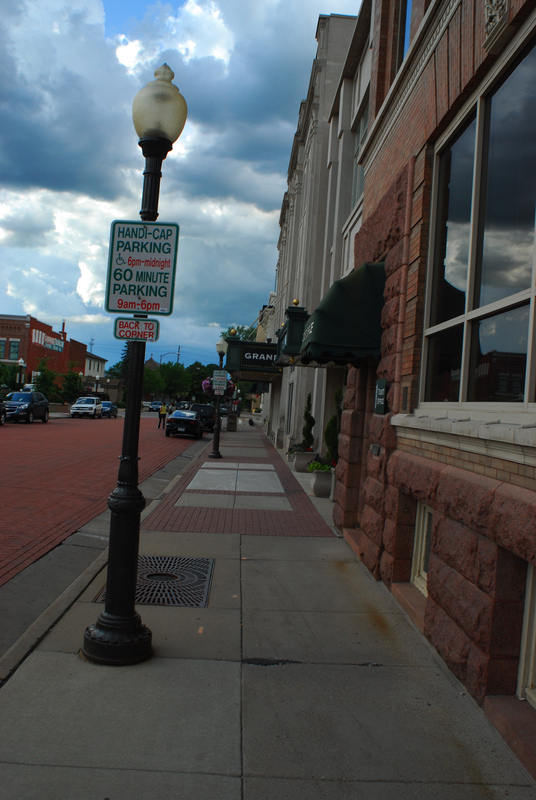 One of the little known gems in Central Wisconsin is the City of Mosinee, WI http://www.mosinee.wi.us/. 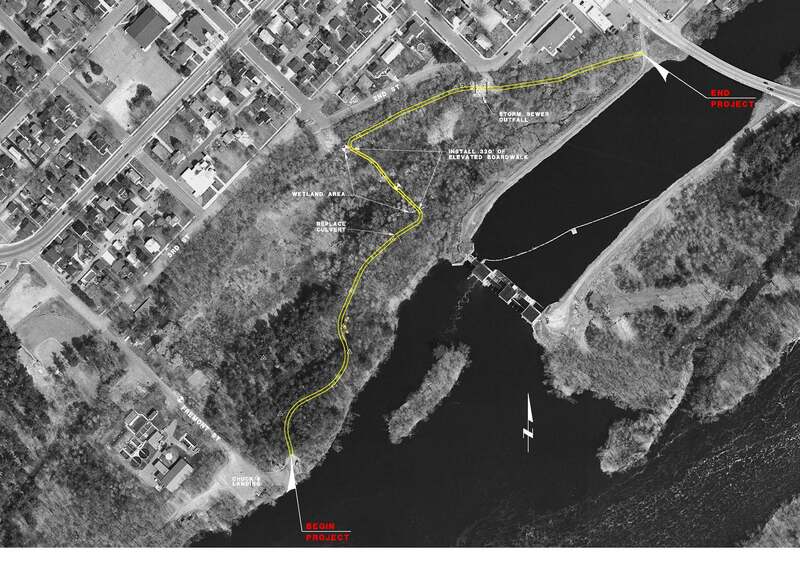 Not too long ago, much like the other communities along the central stretch of the Wisconsin River, Mosinee managed to develop a riverfront trail. The Wisconsin Riverwoods Trail http://www.mosinee.wi.us/parks/Wisconsin%20Riverwoods%20Trail.html is a beautiful example of public-private cooperation. 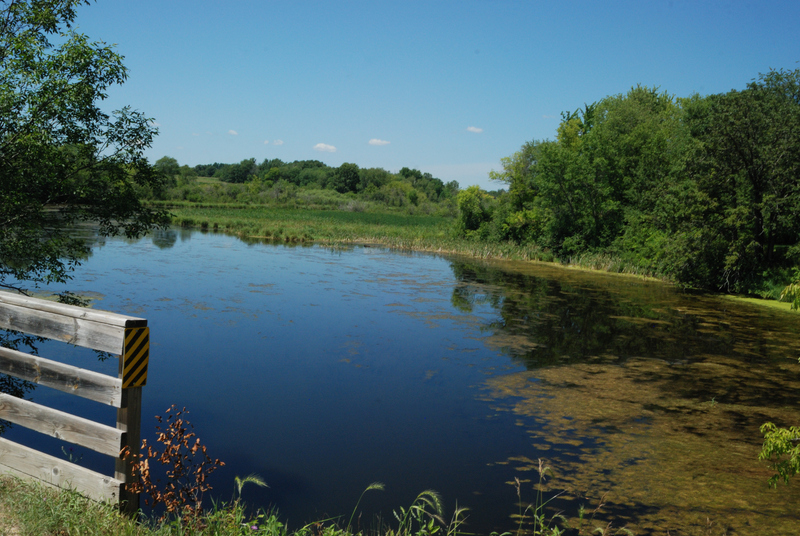 Much of the river frontage in Mosinee was owned by the local paper company which also has a hydroelectric dam. 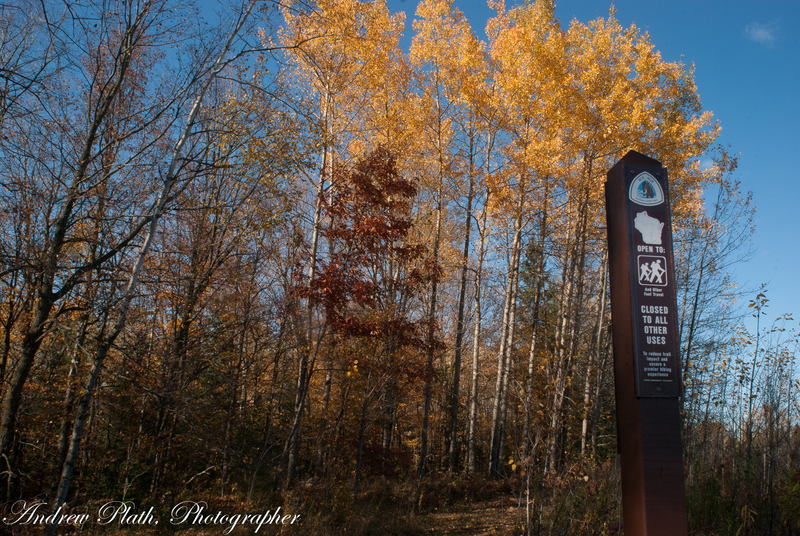 So, if you are traveling through Central Wisconsin, take the Highway 153 exit off of I-39, go into downtown Mosinee and do check out the Wisconsin Riverwoods Trail any time of the year. This is what people see as they leave the parking lot. This is what the Ice Age Trail is all about. 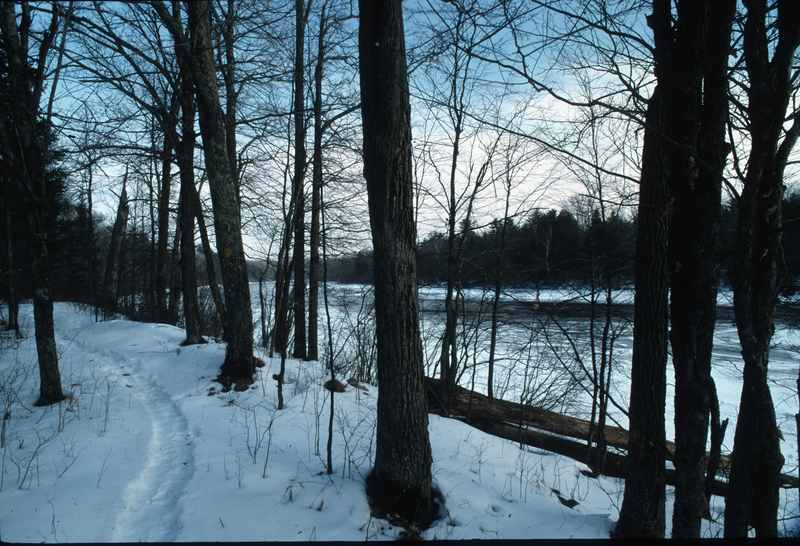 This is the Plover River Segment just north of Sportsman Drive in the Town of Plover near the eastern border of Marathon County. This segment in Marathon County first opened in 2010. 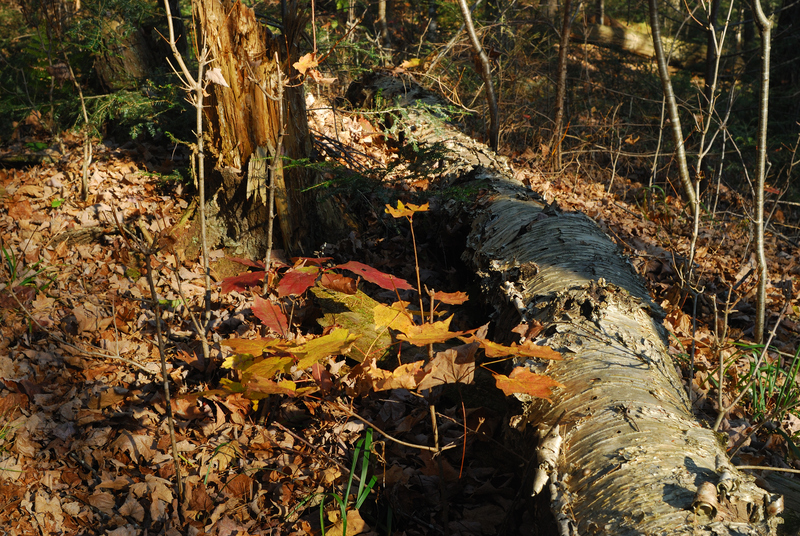 The great scenery is made accessible by many volunteers in the Mobil Skills program of the Ice Age Trail Alliance. I have been on this segment already in different seasons, but autumn produces these stunning colors as the trees ready themselves for winter. 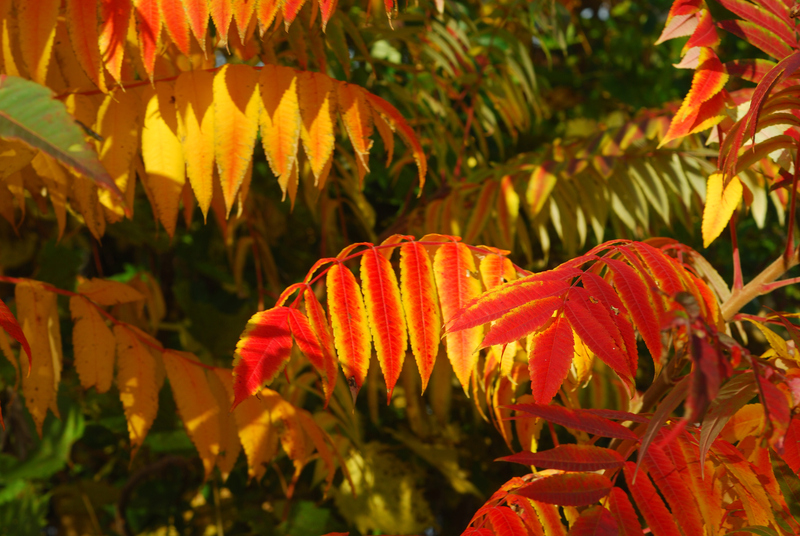 It is the change of the season and the crispness in the air. Nature is taking its course. This is Wisconsin at its best. Our weather is not boring here. It changes with the seasons, and all nature responds to it. 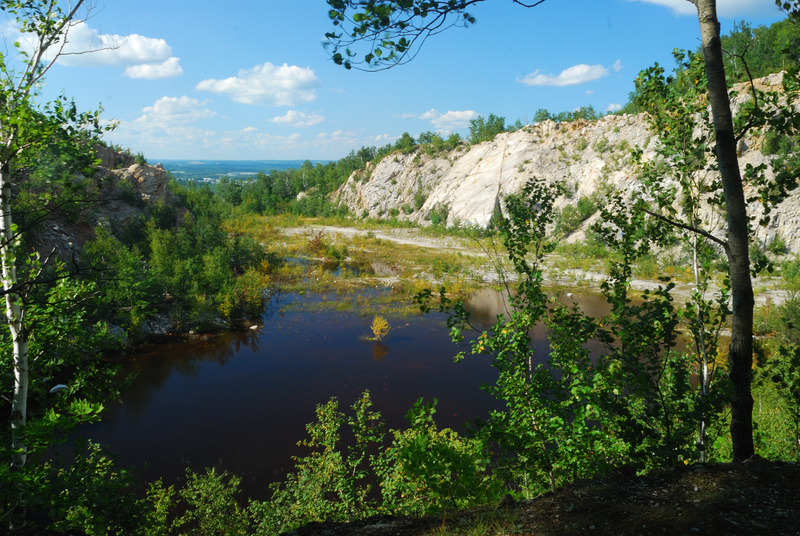 Though definitely not as popular as the Dells Segment, the Plover River Segment has its own experience with kames, kettles, eskers, and drumlins that make up the terminal moraine. 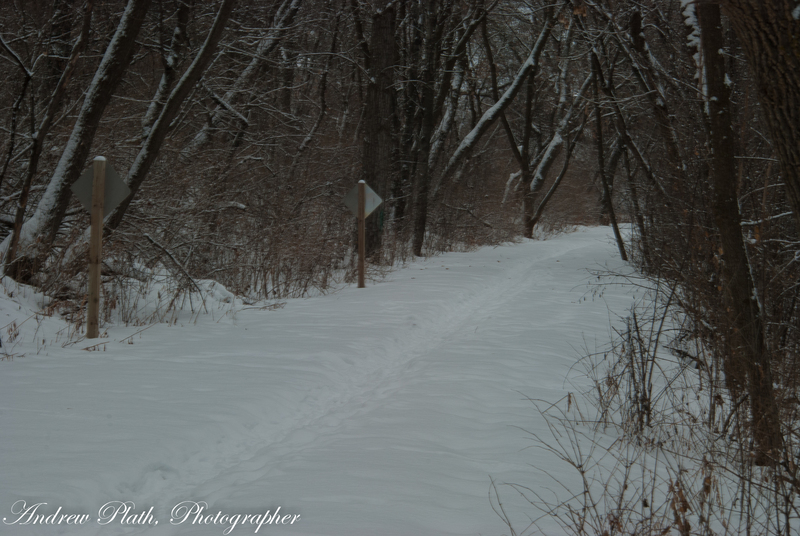 My hope is that you will enjoy these images and want to get out and explore the Ice Age Trail here in Wisconsin. 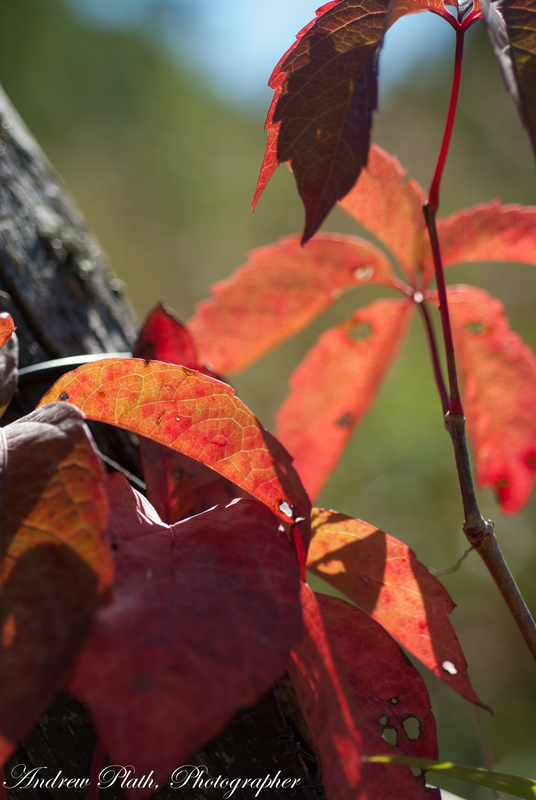 Come see our changing seasons. 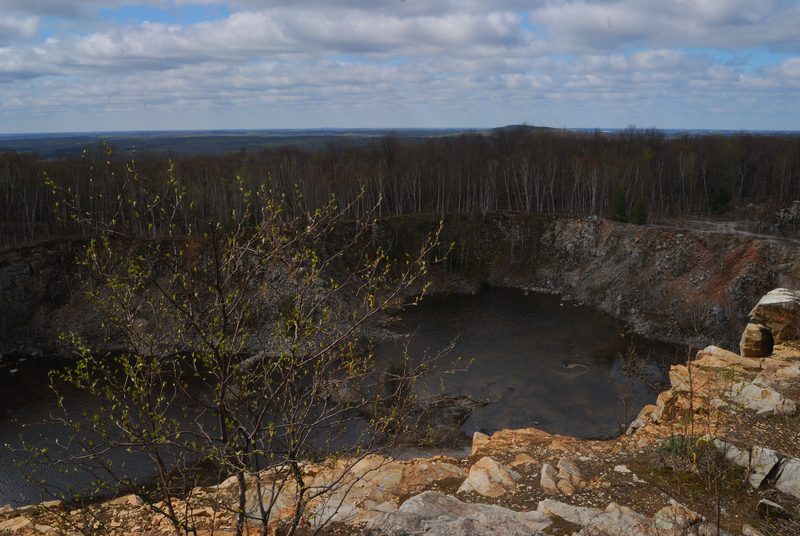 There is more to see on CaptureWisconsin.com. 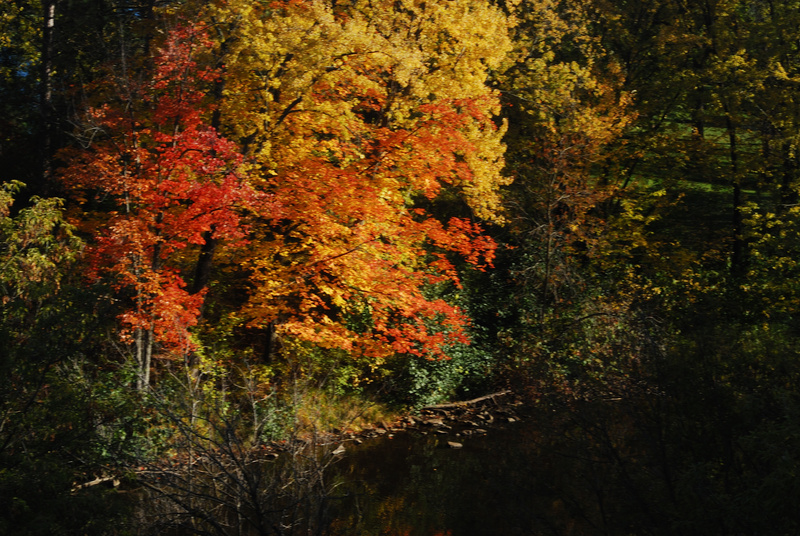 The Wisconsin River takes on brilliant colors along its banks each fall. Living in the north country gives one a real sense of the seasons. 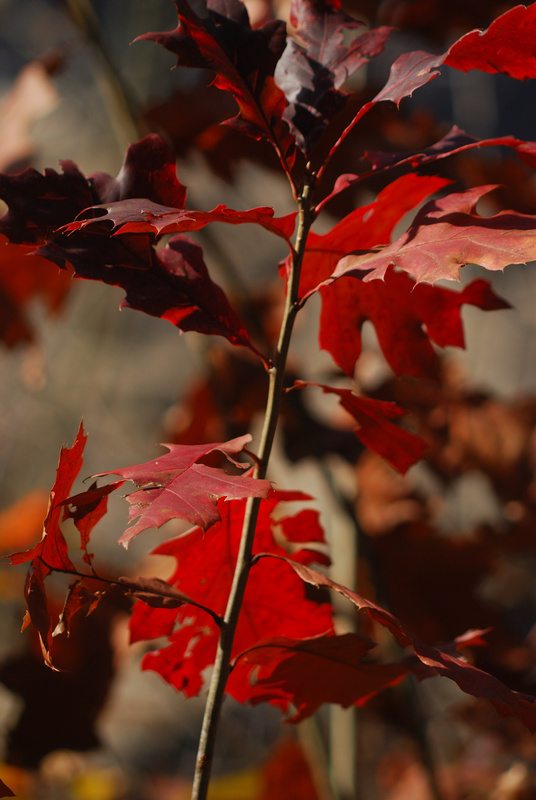 Just by taking a walk down my street here in Wausau in either direction, there is a rich collection of maples, elms, and oaks with leaves of every color. Add in the greens of evergreen trees and you have it all. Looking across the river from almost any point in town, you can see the rich colors that the Wisconsin flows by on every day. The Wisconsin River makes the character of every city and village that it passes through or by. 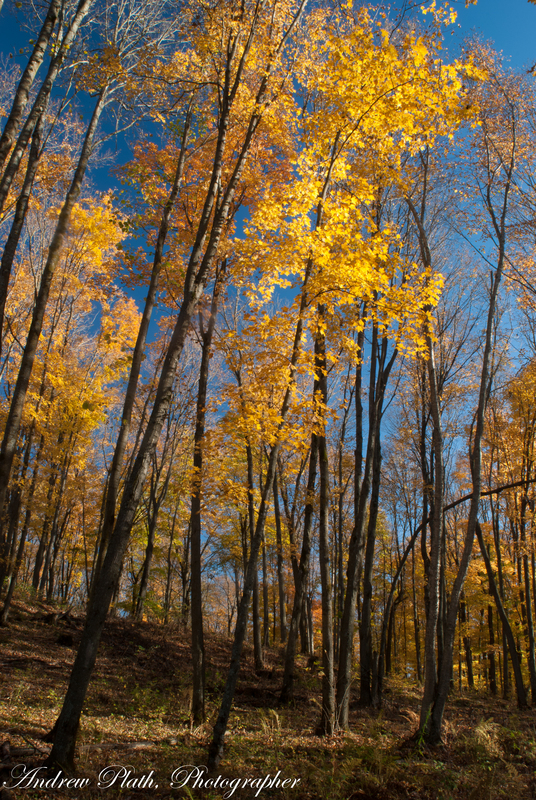 Wausau is nestled in a valley with hills that come alive with color each fall. Some, like, Forest Park, almost touch the river. If you enjoy these images and wish to have one for your own, then journey over and pay a visit to my sales site, http://www.wildlightphotography.photoshelter.com. Images can be printed on a wide variety of materials from matte and lustr papers to canvass wraps to metalic. They make great gifts and will make for any decor. I will also license images to businesses and corporations for calendars, etc. too. 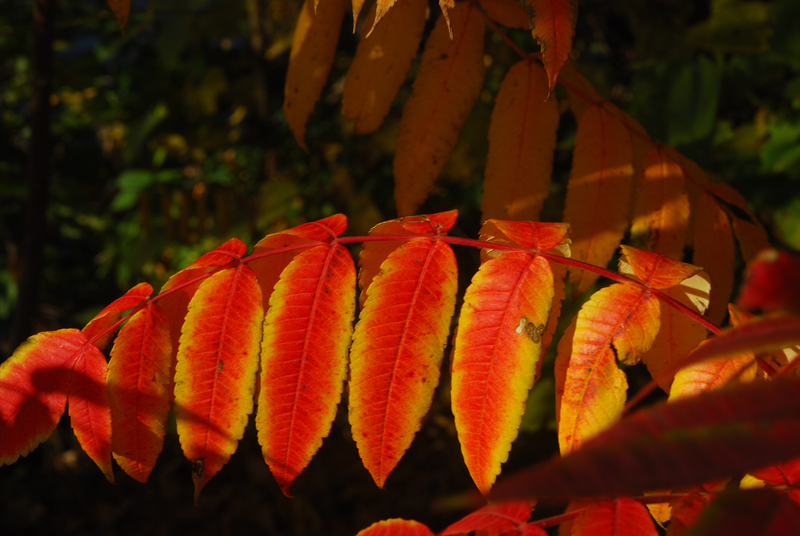 The first plants to change their leaves are sumac and numerous vines that go from green to red. Here we have it already. 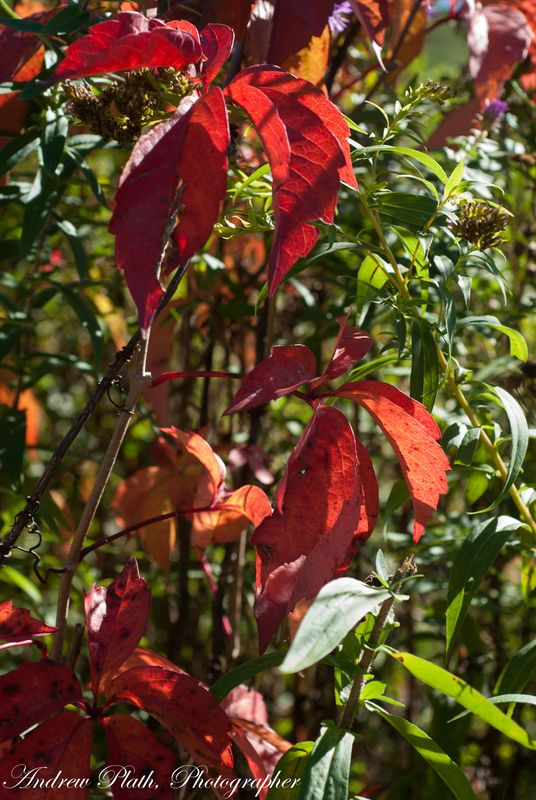 It’s near the end of September and the colors have started to change again. 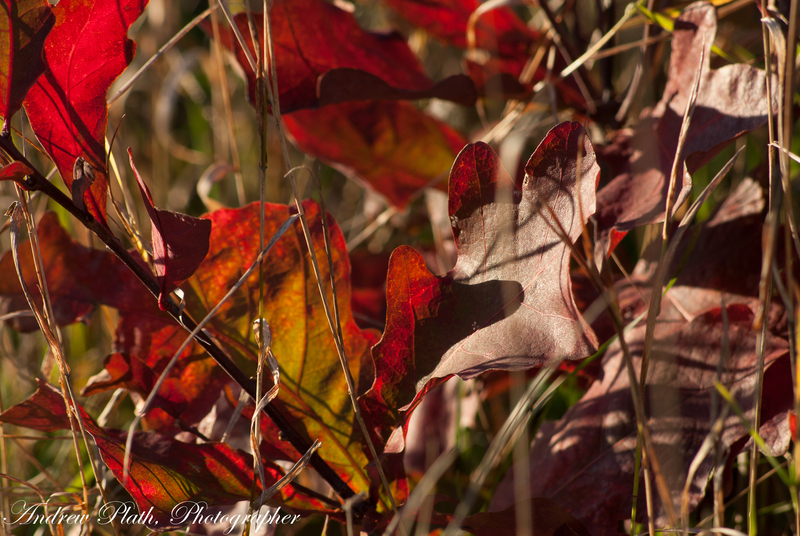 Shutterbugs like me are wide-eyed and looking for color. 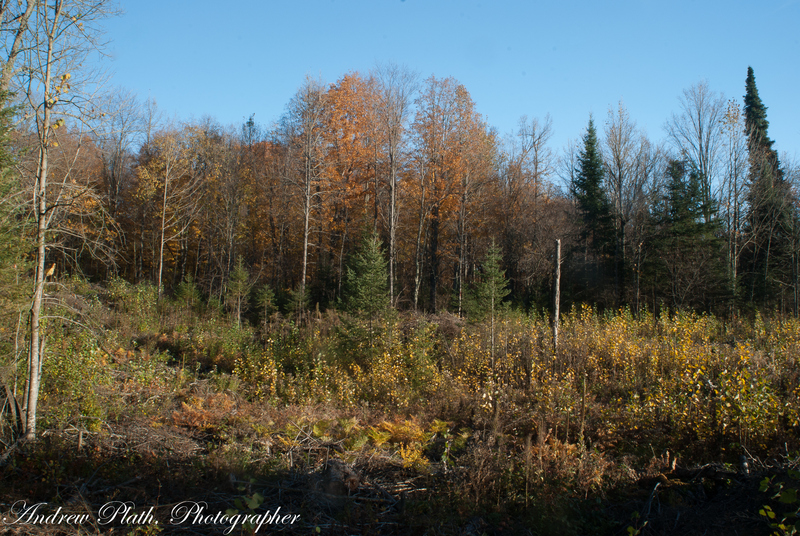 Living in Wausau, the Paff Woods is a good place to start. 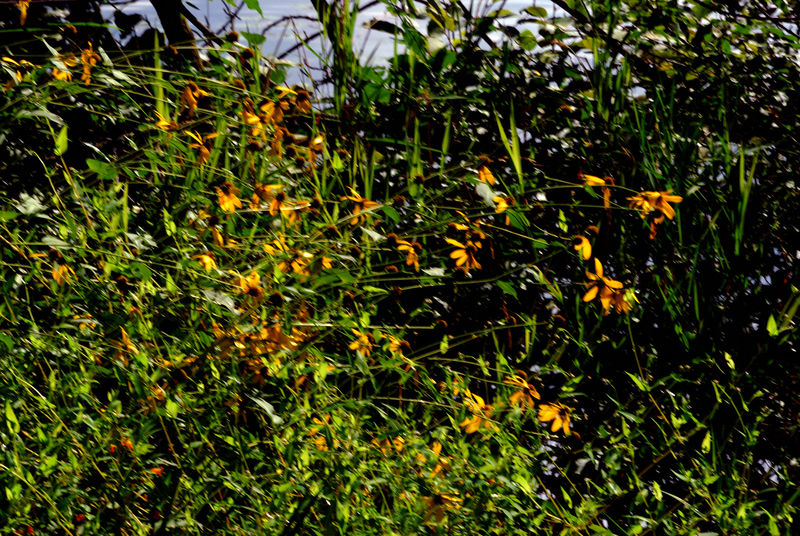 Black-Eyed Susans often line the banks of Wisconsin’s Rivers. Not every image leaves a digital camera perfectly. 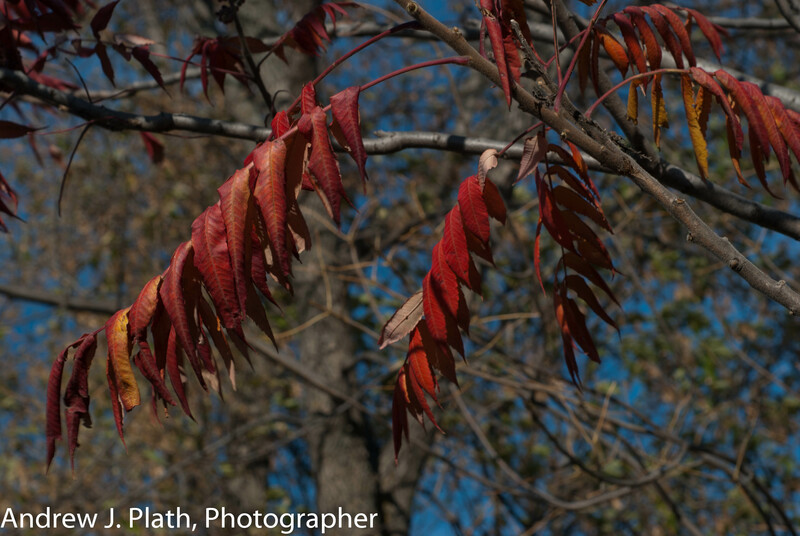 Sometimes you have to correct the image in Photoshop or, in my case, it’s Capture NX2. 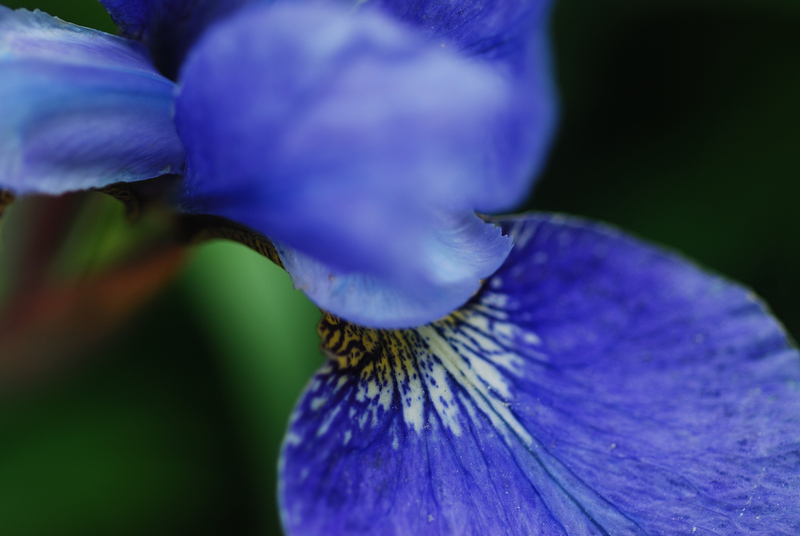 To bring out the color, you often have to adjust brightness, etc. 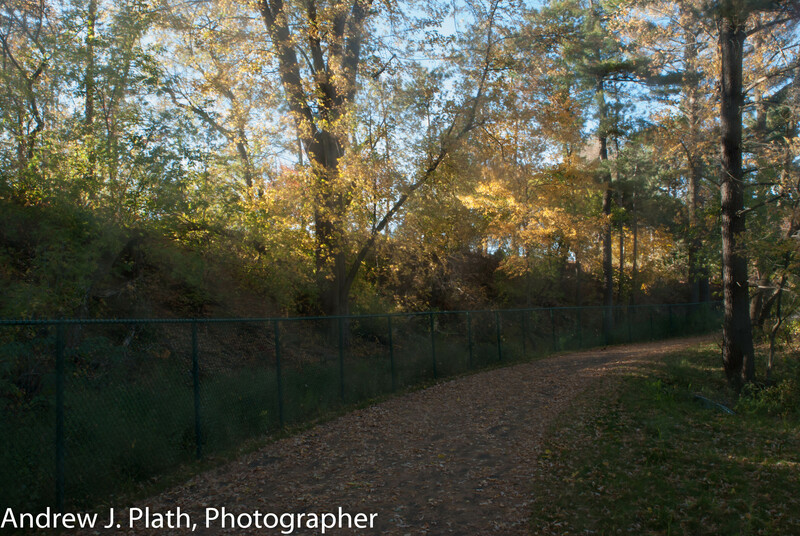 Capture NX2 allows for this by letting the user adjust the histogram graph which I did. I then adjusted the primary colors. 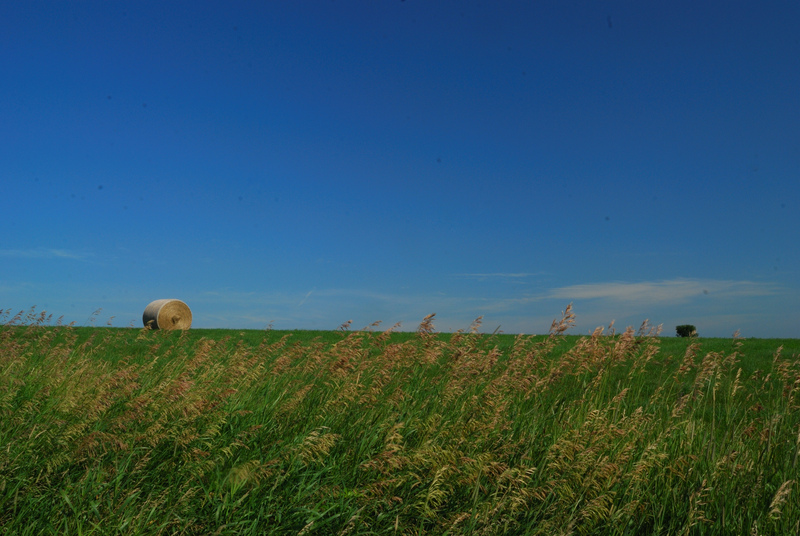 What do bicyclists and joggers see when they travel the country roads? We see the farms and their families working the land, growing the food that we eat, raising the cattle from which we get milk and cheese. Ask me where do you find the real Wisconsin? It’s here! This farm was very much a part of my life. It belonged to my great Uncle Bernard “Ben” Rusch. Way back when I was a student at Trinity Lutheran in Wausau, John Kupsky had us do an assignment in his Art Class to draw perspective. Simple perspective means lines converging to a point on the horizon. ERailroad tracks easily lend themselves to this as the two rail tracks converge on each other. This is a spur line and I am facing south from Bridge Street just east of Walgreen ‘s on Wausau’s west side. These tracks feed into the Graphics Plus packaging plant just to the north of Bridge Street. 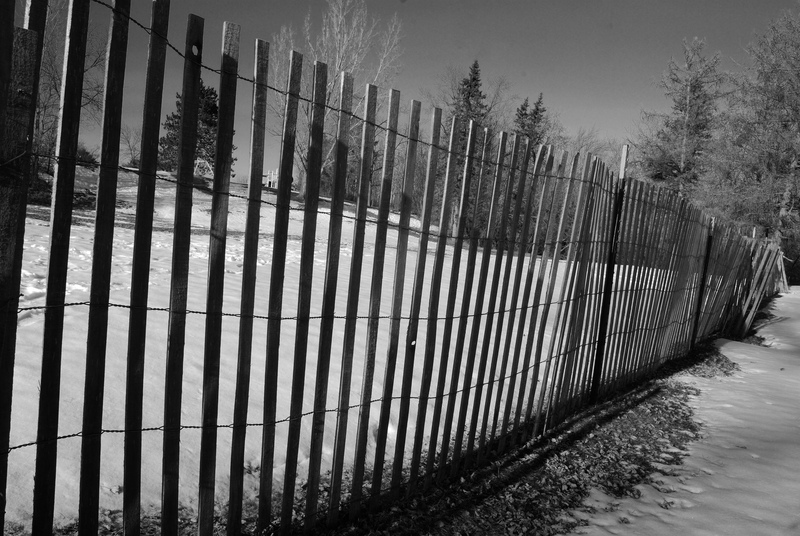 Even the lines of the snow fence form a degree of perspective using parallel lines. Some of these images are going to be in the black and white category on CaptureWisconsin.com. So log on to that site. There is a link to it on this blog site. Just get on it and vote! 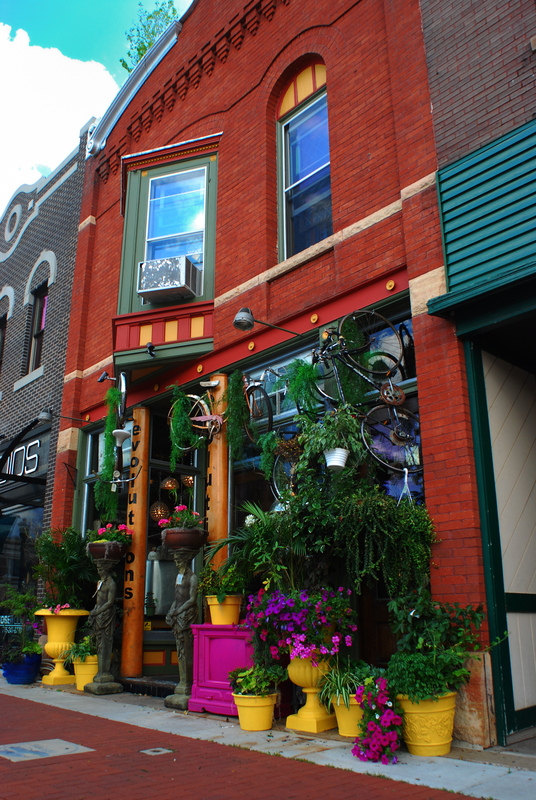 One of the oddest looking buildings in Wausau is the Black Purl knitting store on 3rd Street just north of the downtown district. If you take a walk on Wausau’s River Edge Parkway or pass by on 3rd Street, you cannot help but notice the stark overtones of this building. To the naked eye, it looks like it could have been in a fire with its blackened siding. 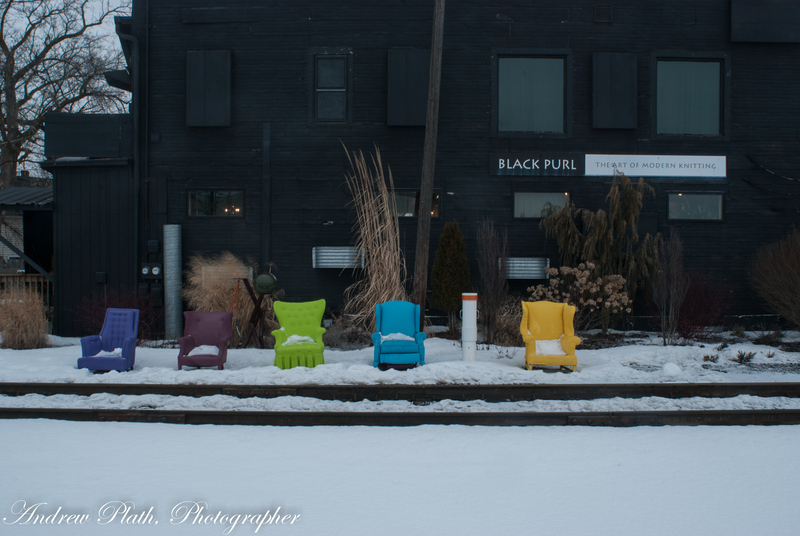 It must seem odd to the railroad locomotive operators to see these colorful chairs sitting as if they were waiting for a train to come by on the main line. It is outdoor art! Art comes in all forms and shapes and in all colors including black. 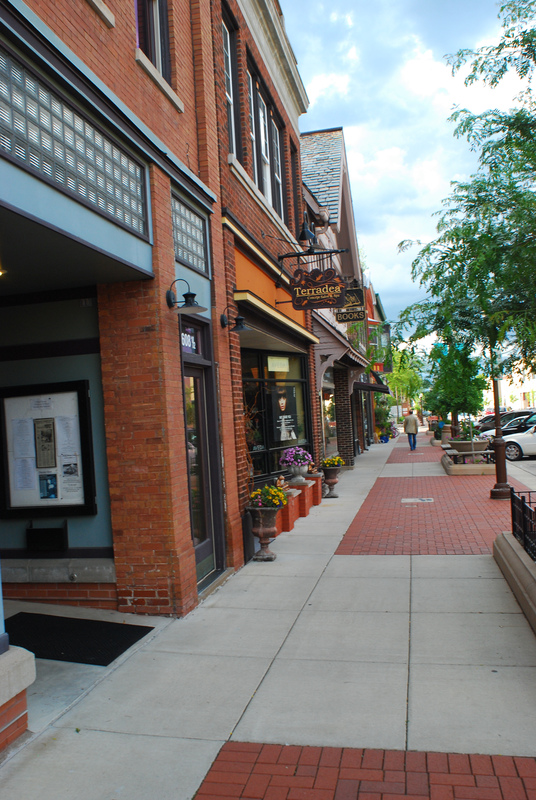 Take a walk with me through my hometown, and you will see all of it and wonder why. 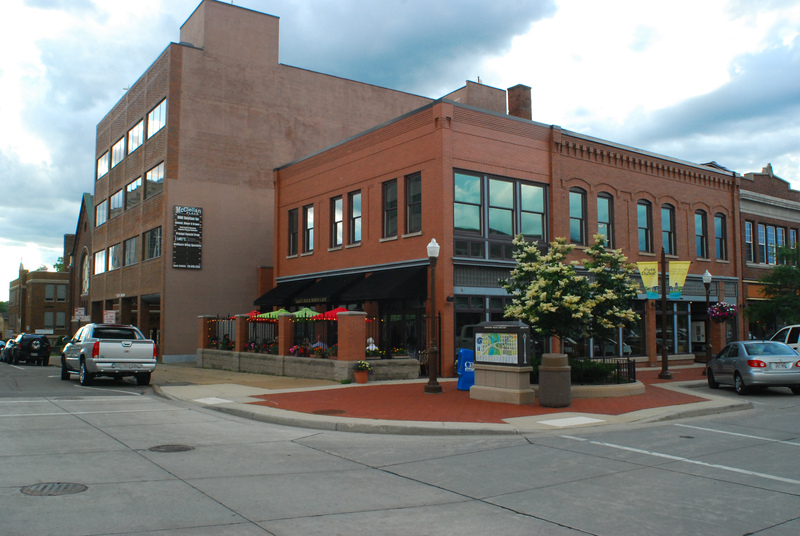 One of the most distinctive buildings in the Wausau area. 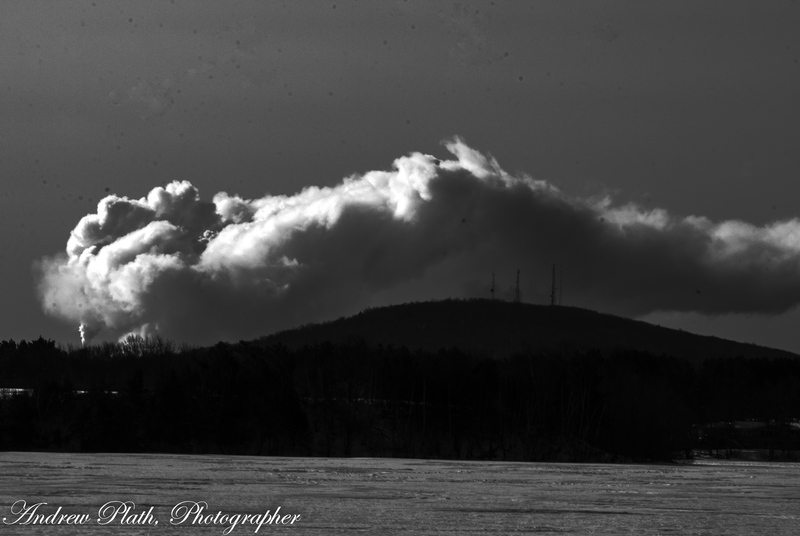 A powerful image of steam from the Weston power plants flowing in the sun over Mosinee Hill. Water running over the rocks at the Dells of the Eau Claire County Park..
Water pouring over the rocks at the Dells of the Eau Claire River. 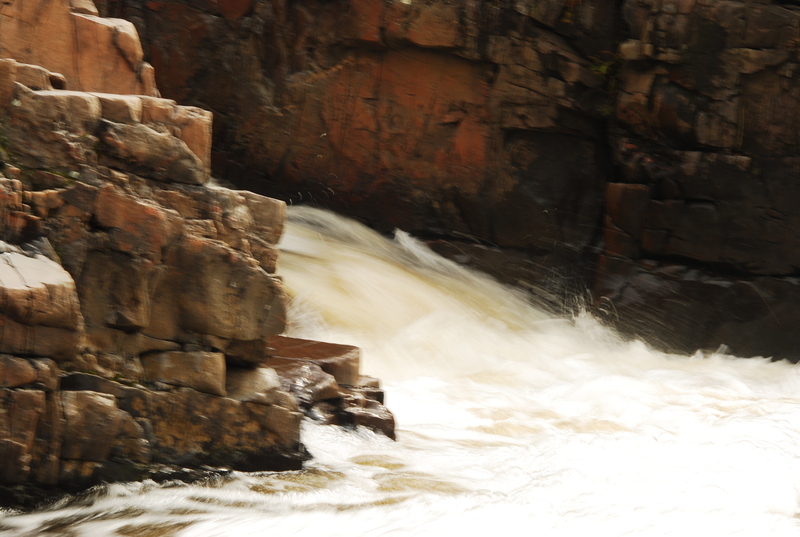 Rivers are wild living things always flowing, always meandering, working their way down hill. 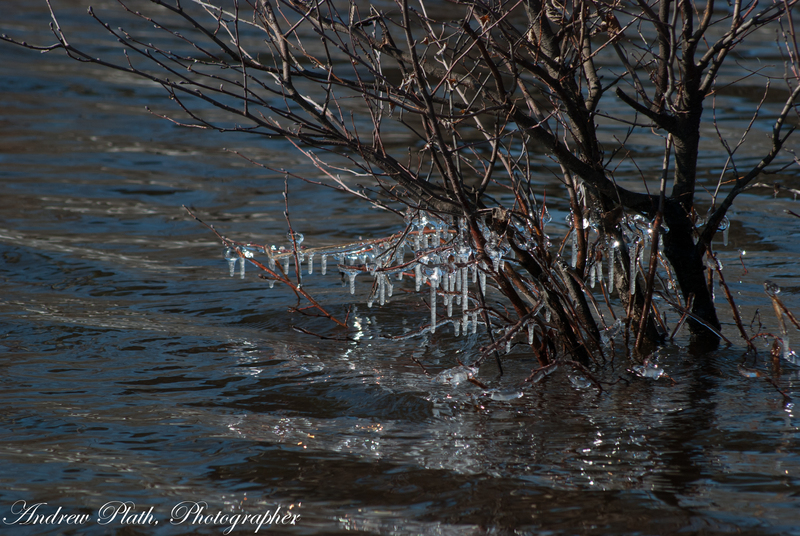 These pictures remind me of springtime when the forces of nature awaken from a long wintry sleep. 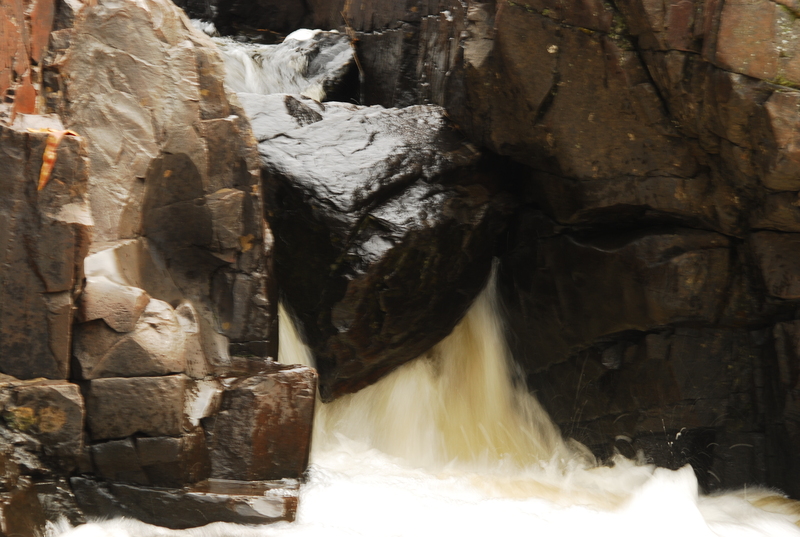 These rocks are part of the gorge created by the Eau Claire River in eastern Marathon County, WI. A fine stop on the Ice Age Trail. 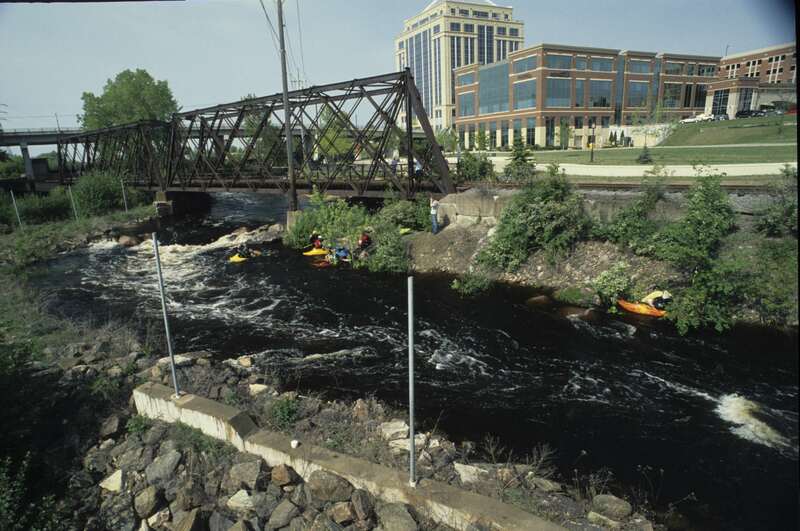 The Wisconsin River itself flows through the heart of the City of Wausau on its own journey to the Mississippi and to the Gulf of Mexico. The Wisconsin is a part of life here in Wausau. On it’s east channel near downtown paddlers challenge the rapids and play holes of the racecourse at Whitewater Park, while, over on the west channel, anglers work to land walleyes. Each in their own way see the river as a natural resource to be shared by all people.. This is the trail going north from Popular Lane. 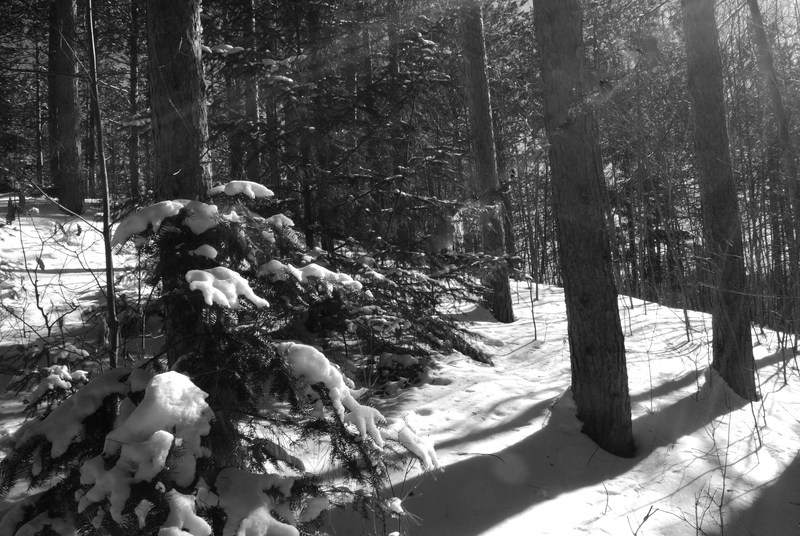 Even in Black and White, the trail looks good. So seldom in Wisconsin do we get winter snow that actually remains on trees. Usually by the time the skies clear, the wind has blown the fluff off. 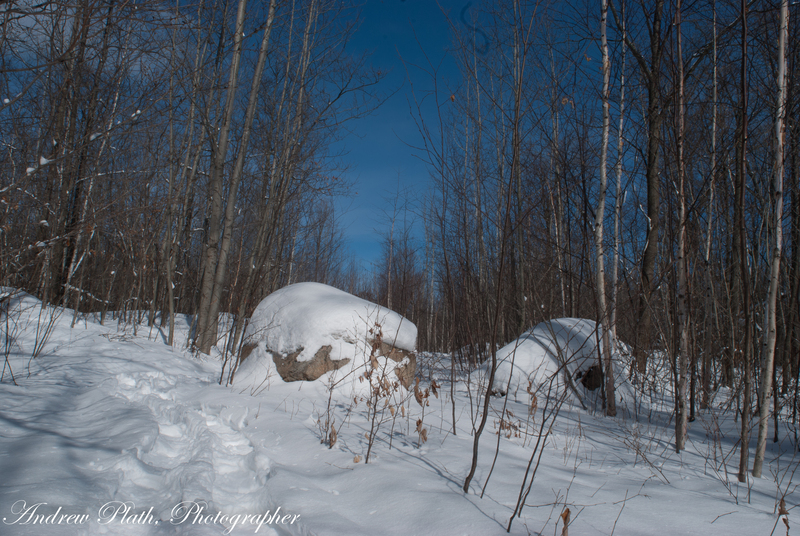 On January 26, 2013, I ventured out to the Plover River segment of the Ice Age Trail near Aniwa, WI. It was an awe-inspiring experience just to be out there. 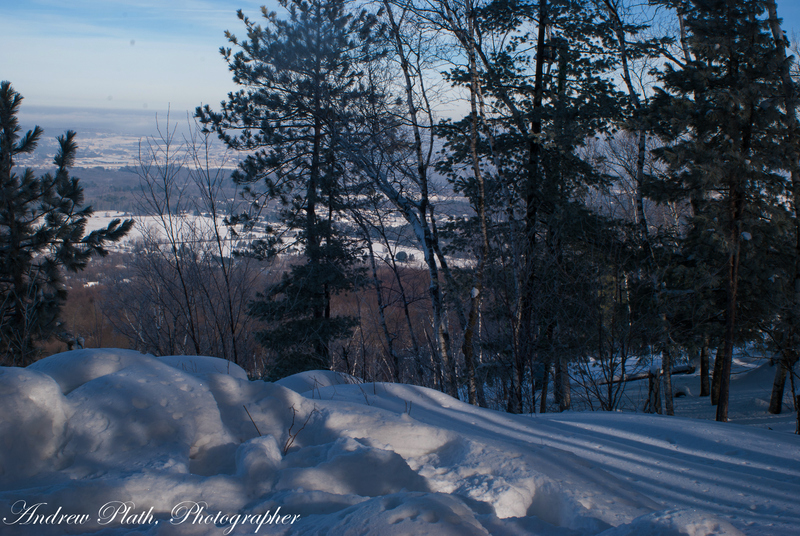 It was so peaceful to get away from the hubbub of life in Wausau and experience this. 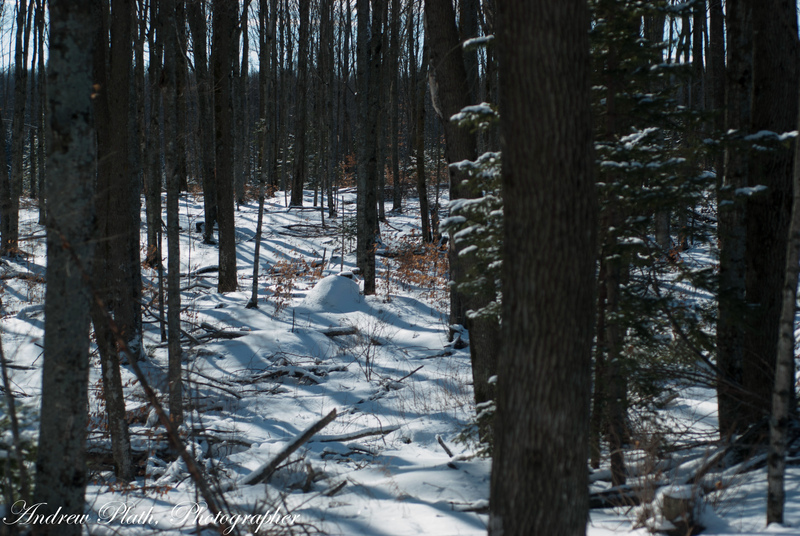 I love breaking a trail through new fallen snow in the quiet stillness of winter. The peace is there. It is my hope that you feel just as moved by these images as I was when took them. 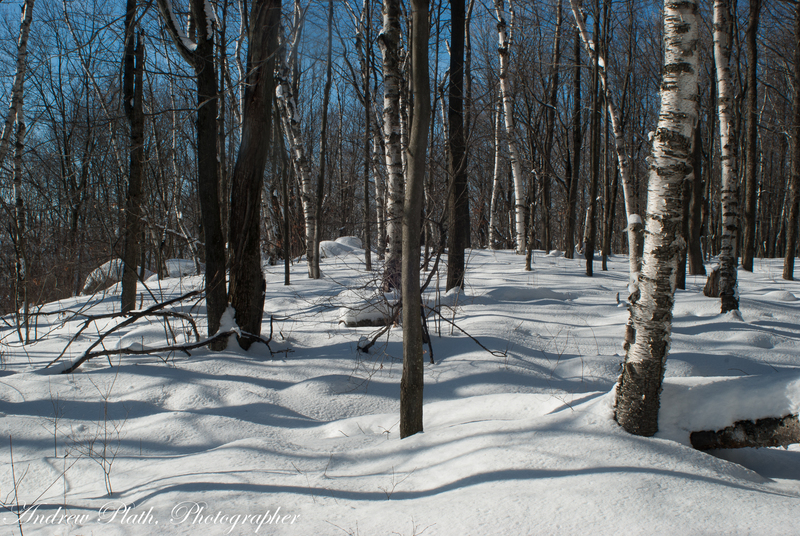 It was a great day just to put on my snowshoes and take a walk through the woodlands of eastern Marathon County. We are really blessed in living here with so much so near and four seasons to boot. I will be out on the trail somewhere this weekend. 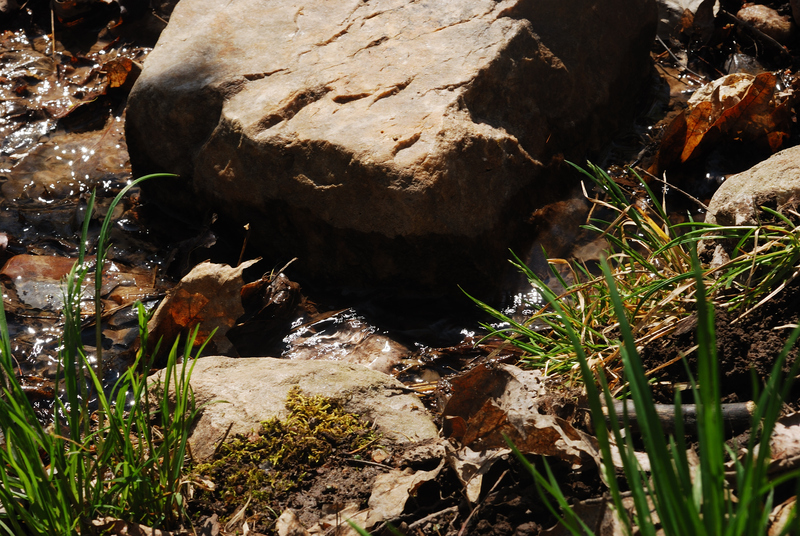 The rock seen here was one that I encountered while working with Will Sanford on a clean-up crew from the Marathon County Chapter back in 1996 on the Ringle segment near the landfill just north of the Mountain- Bay State Trail. We laughed at it because it was right in the way of the trail. It is an erratic moved into position by the last Ice age glacier. As such, we were not even going to try to remove it. 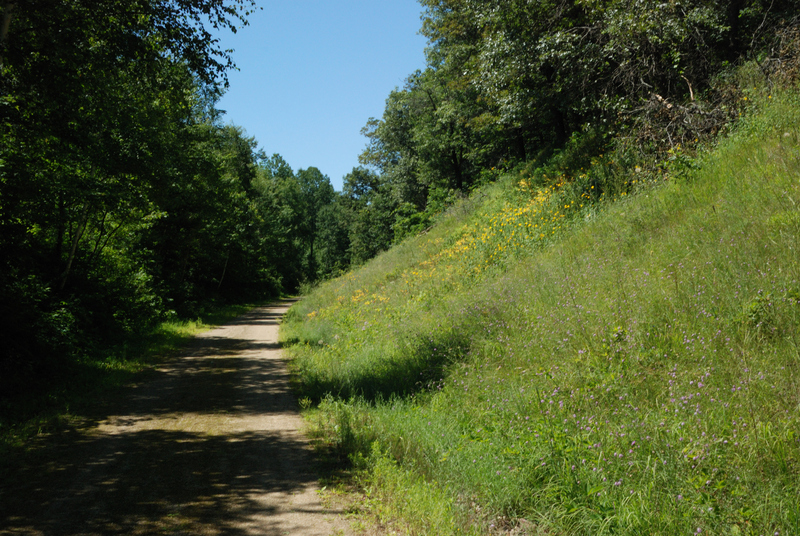 It is a part of the trail in Marathon County. It is amazing how common ordinary objects can make one think about how they look. 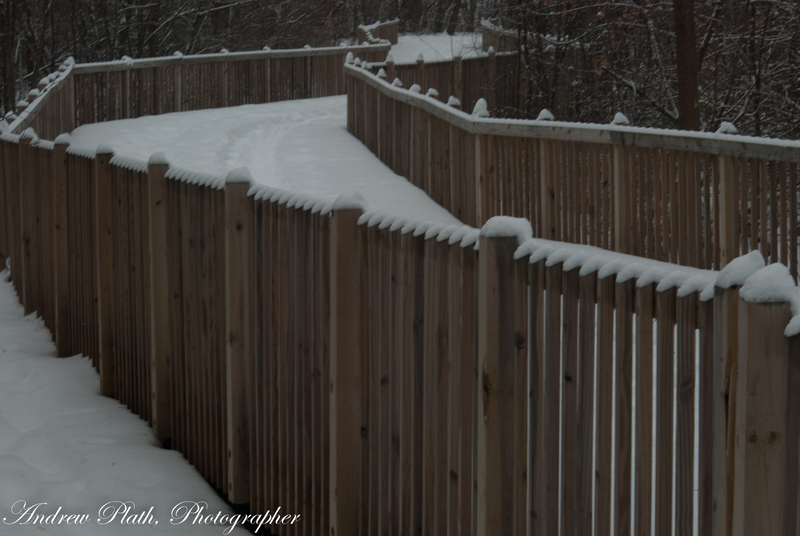 The snow fence is one of those ordinary objects where form follows function. It has a pattern all of its own. 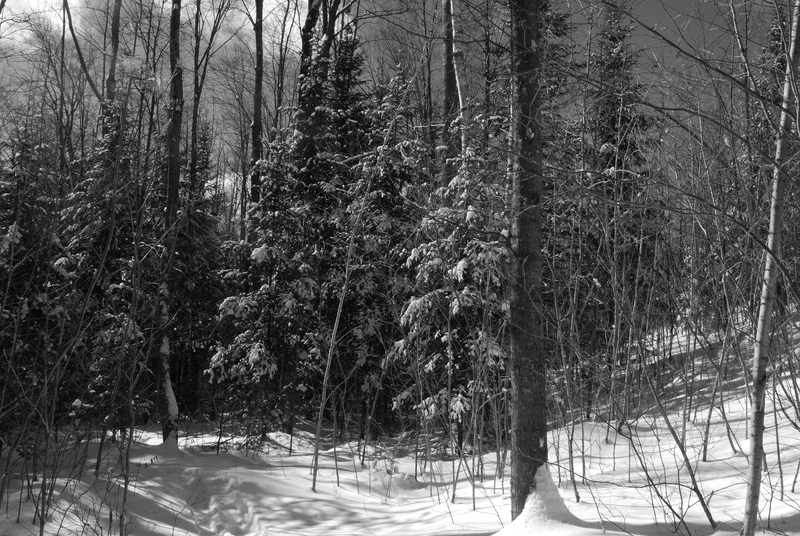 Digital photography allows one to shoot in color, but think in black and white. 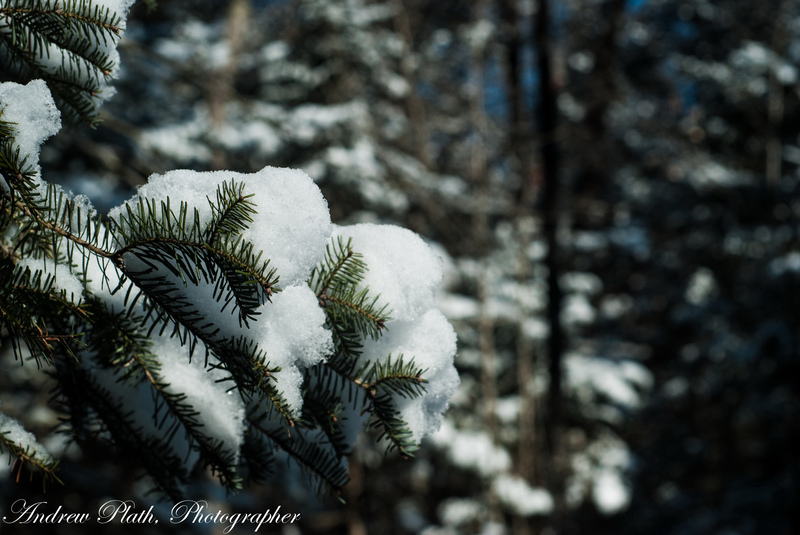 A wintry walk amidst the White Pines of Marathon Park. 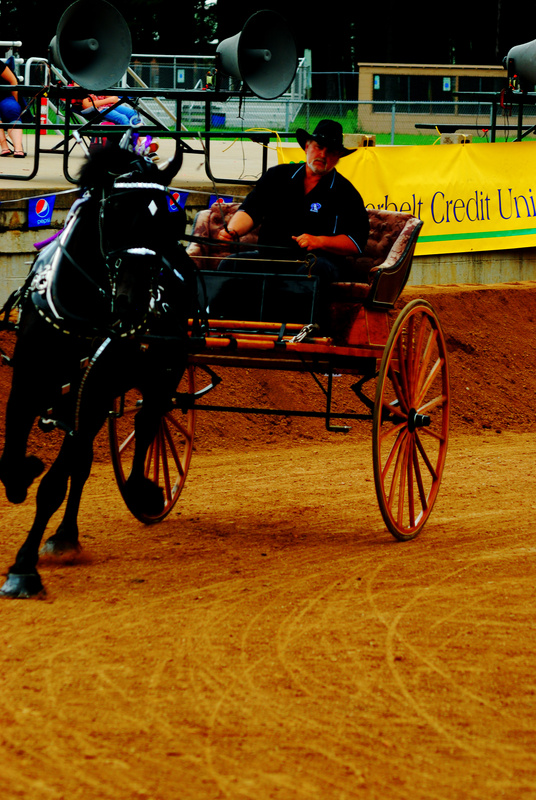 Gone is is the excitement of carnivals and the bustle of animals in people in the fairgrounds. The cold silence remains. The time is there to focus on the towering majesty of these living remnants of Wisconsin’s past in the “pinery”. These are the giants that once dominated our forests with their towering beauty. These giants are decorated for the season with fluffy white snow. 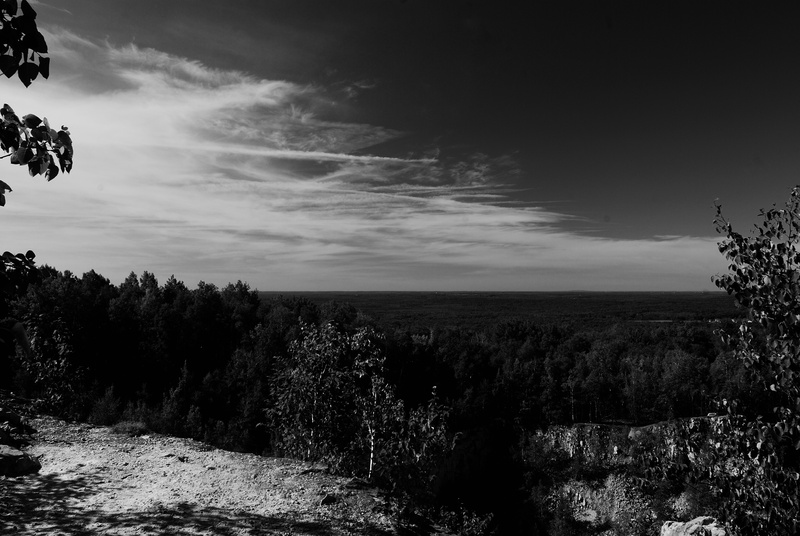 They are the silent watchtowers guarding Wausau’s western entrance. They continue to shelter birds and other wildlife. 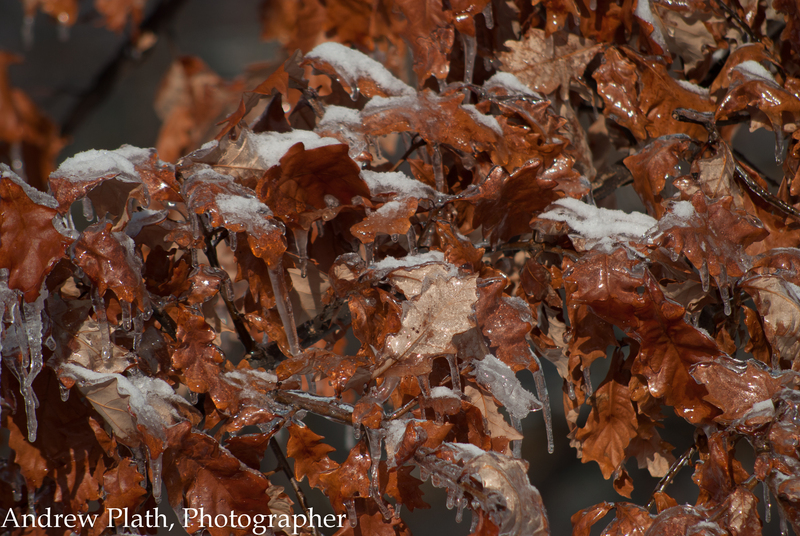 Nature decorates these trees for Christmas in her own way. This is from just along the river at Rothschild. 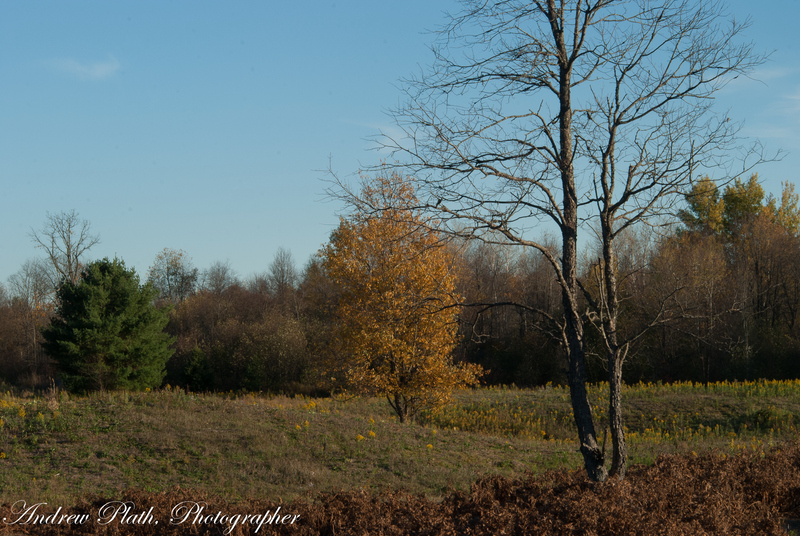 Even though the colors have changed and the trees have all dropped their cover, I somehow thought there was something worth catching in this image from my own backyard. 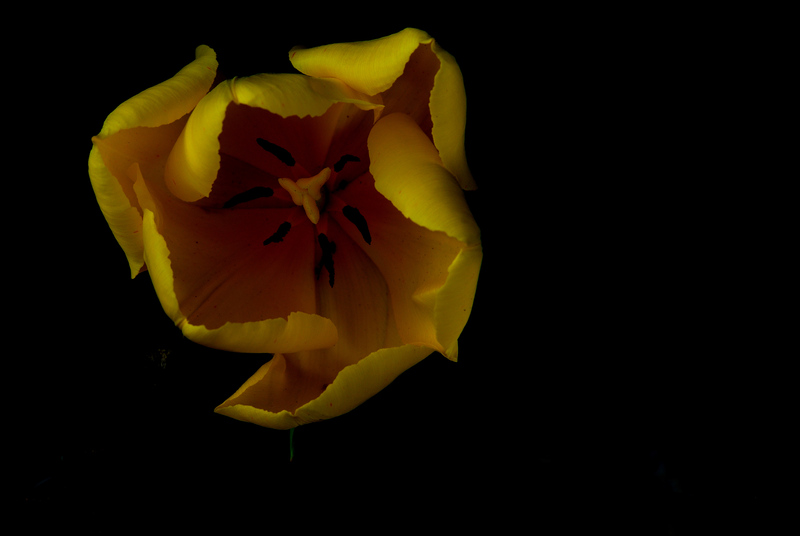 So, with my D-80 and a 60 mm Micro-Nikkor with a star filter attached, I set out to see what there is to be seen. 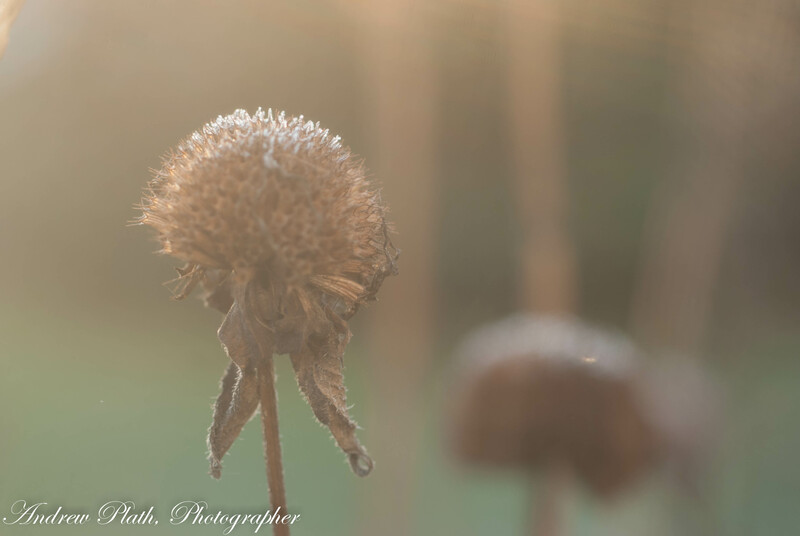 Frost on bee balm flowers in the diffused light of morning. 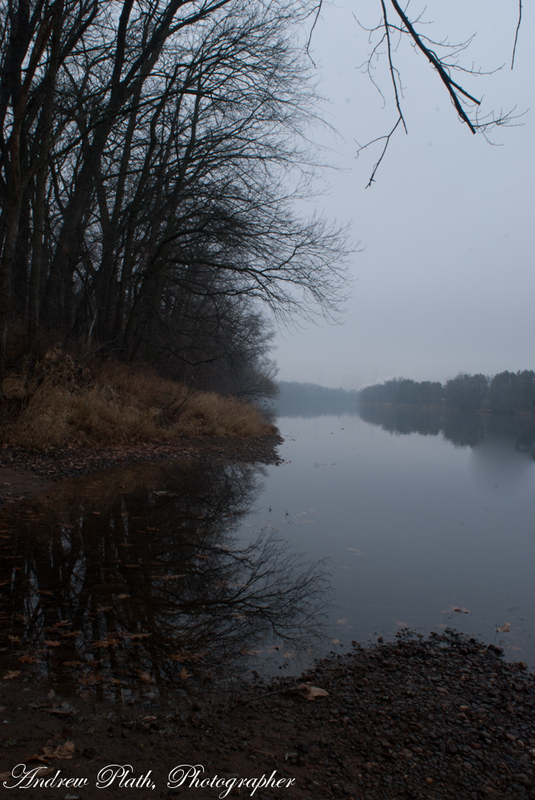 The Wisconsin River from the west bank north of Bridge Street in Wausau. 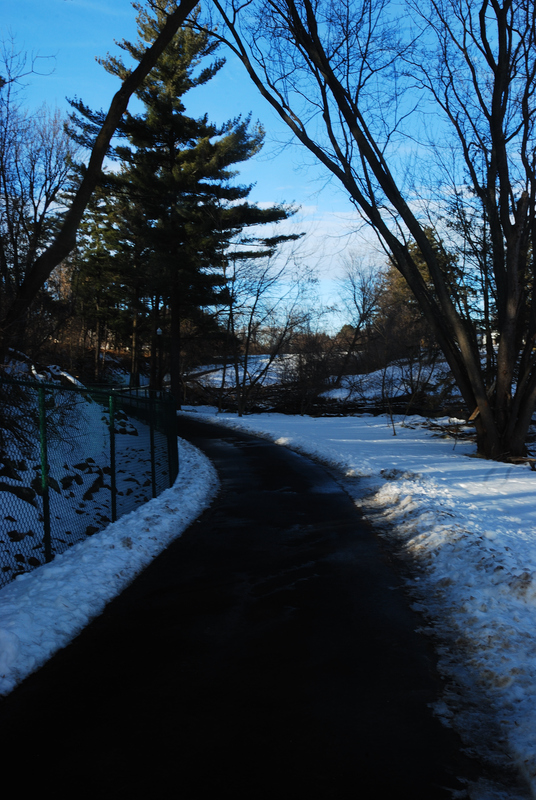 Northern end of the Rivers Edge Walkway on the west side. 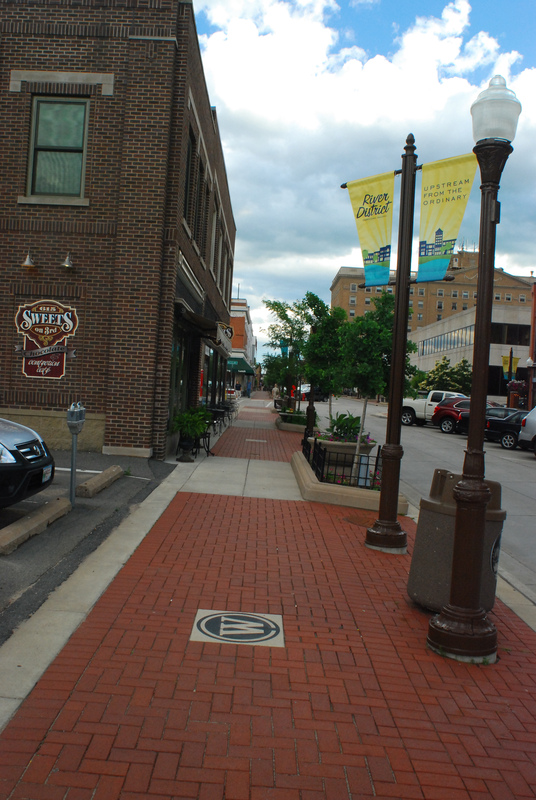 Wausau is continuing to expand my favorite walkway in the city. 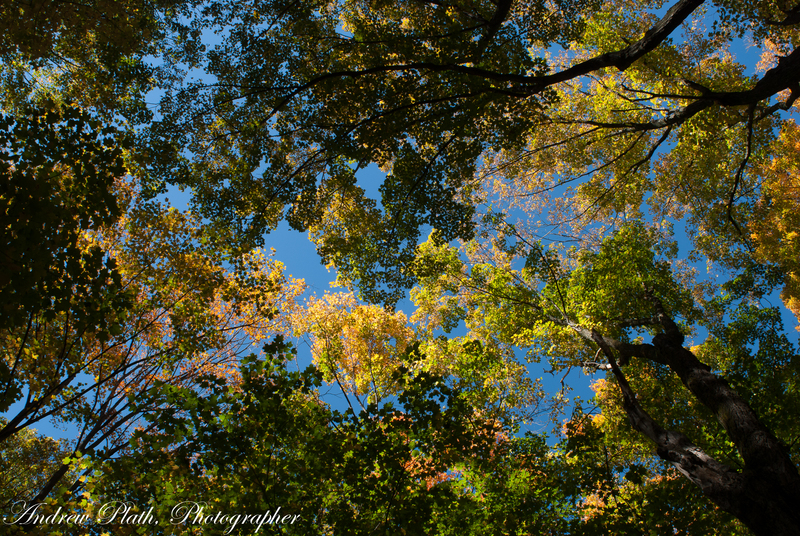 For the meantime, you can sample some of the fall scenery in my images here. 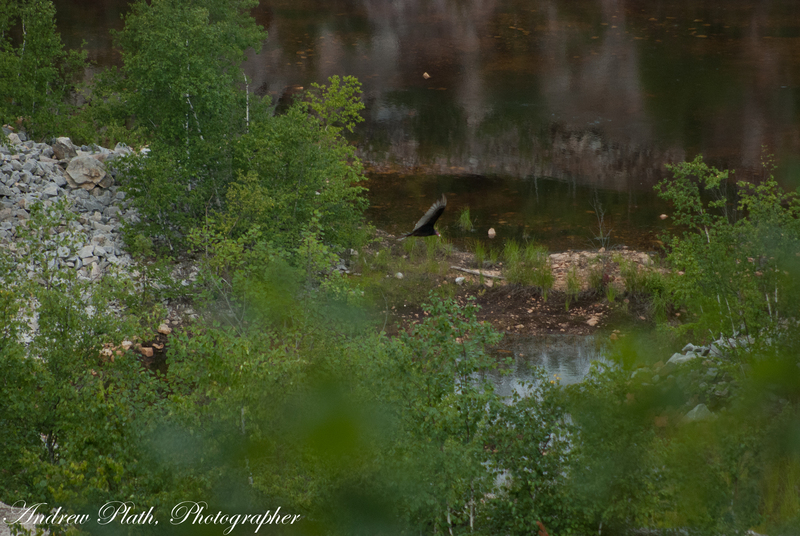 Many of my best images are available for sale at http://wildlightphotography.photoshelter.com/ and others are also seen on Capture Wisconsin http://www.capturewisconsin.com/photos where prints are also available. If you have trouble ordering through Photoshelter, tell me about it. I can help you select the print and give you a wide range of choices through myphotopipe.com I have ordered prints through Myphotopipe.com and they have always come out on top with quality high-resolution emulsion-based prints and wraps of almost any size to fit your walls. 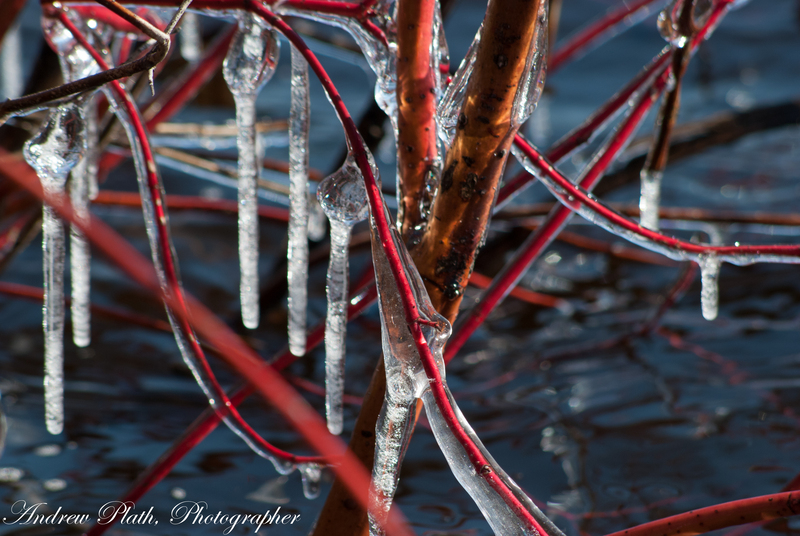 If you are looking for images for calendars, etc, my work will fit fine. Just let me know. Leave me a comment, and I will get back to you ASAP. Some of the great places that make for powerful landscape imagery are never really too far from where we live. 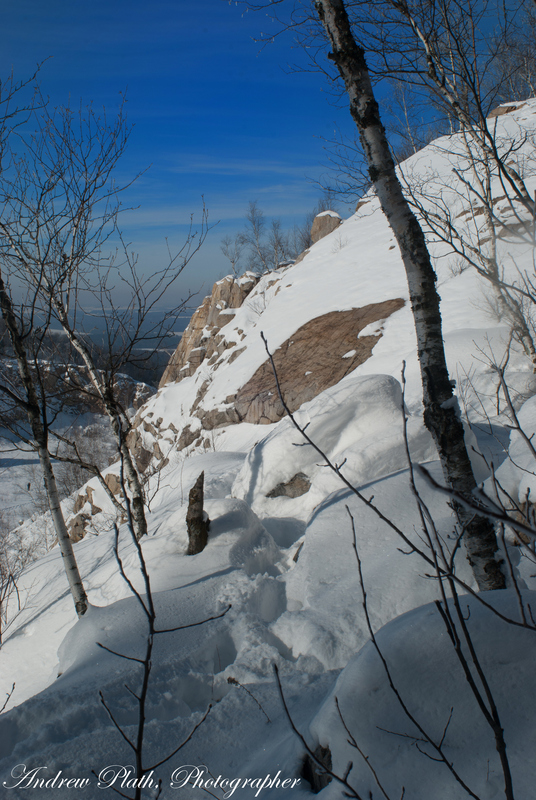 A few years back, with the help of the Knowles-Nelson Stewardship fund, the Wisconsin Department of Natural Resources was able to make another great addition to Rib Mountain State Park. Years ago, 3M mined quartzite from Rib Mountain before developing a much larger quarry north of Wausau in the Town of Maine. 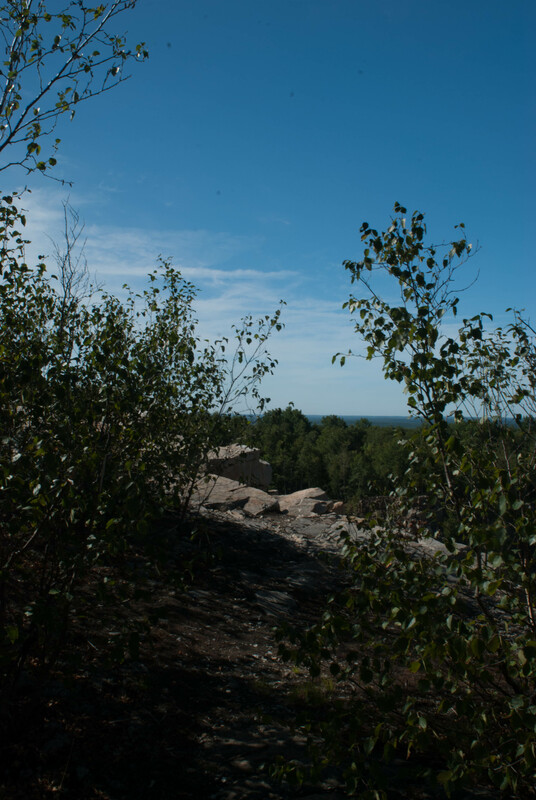 When the Wisconsin DNR purchased the old quarry on Rib Mountain, The Friends of Rib Mountain State Park immediately went to task to develop new hiking trails to add to the existing 4 miles of trail already in the park. 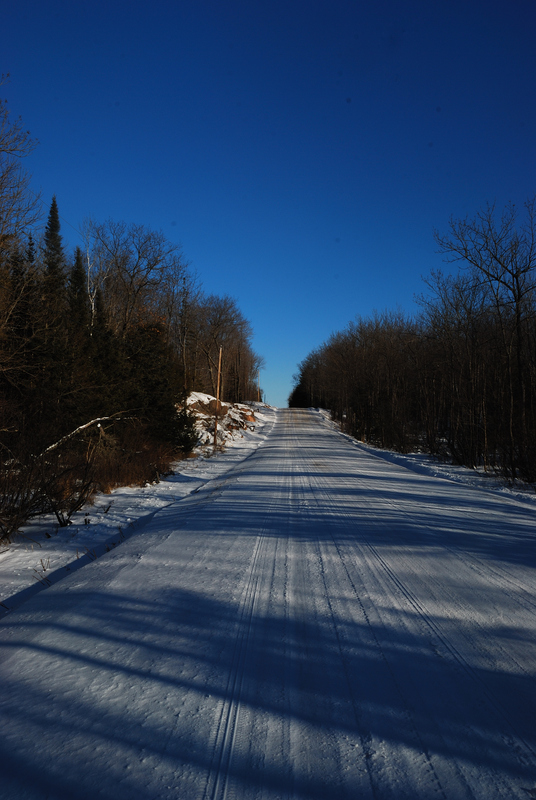 In doing so, they also added history as one of the new trails passes through the site of the Knopf family homestead where Rib Mountain”s first settlers lived. There is also the remains of an old dynamite shack where explosives for blasting out huge seams of quartzite were stored. The trails have become immensely popular for park visitors. 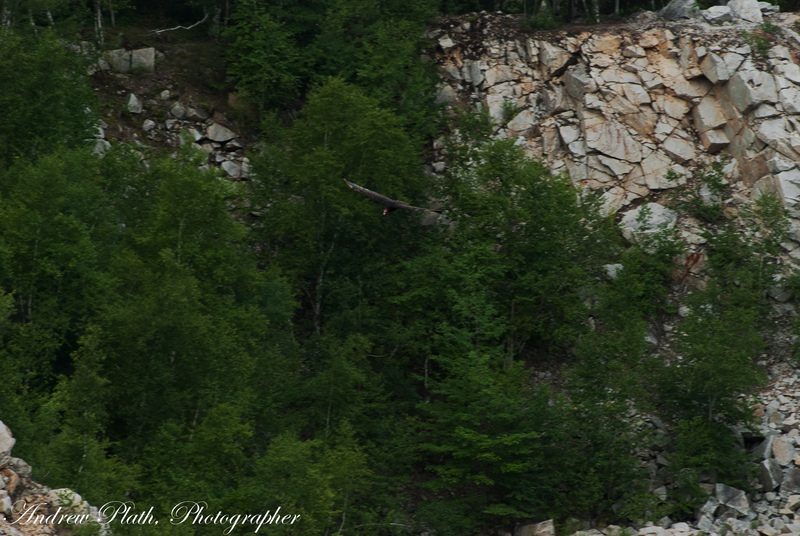 The Turkey Vulture Trail provides an alternative access route for hikers to the park, and yes, if you look up, you will see these vultures circling near the southern rim of the quarry looking for carrion to provide them with food. 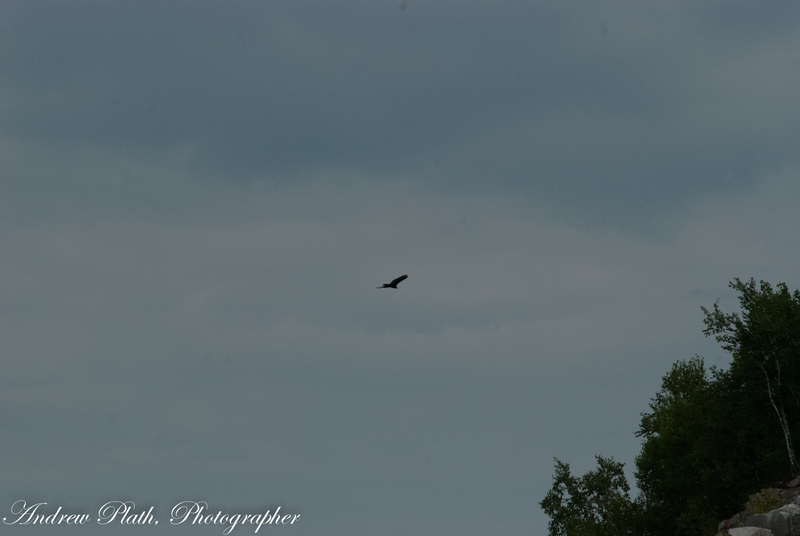 On one of my hikes, I had a turkey vulture pass over me by just ten feet. With the influence of men like Ansel Adams or Galen Rowell in me, I could not resist dragging a camera to capture these views. 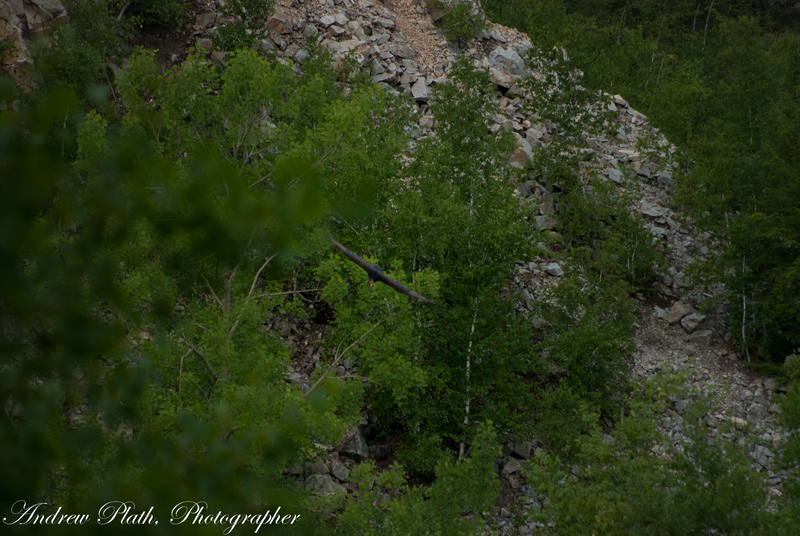 The quarry is man-made and small compared to Yosemite or other far flung places, but it is still much worth the hike. 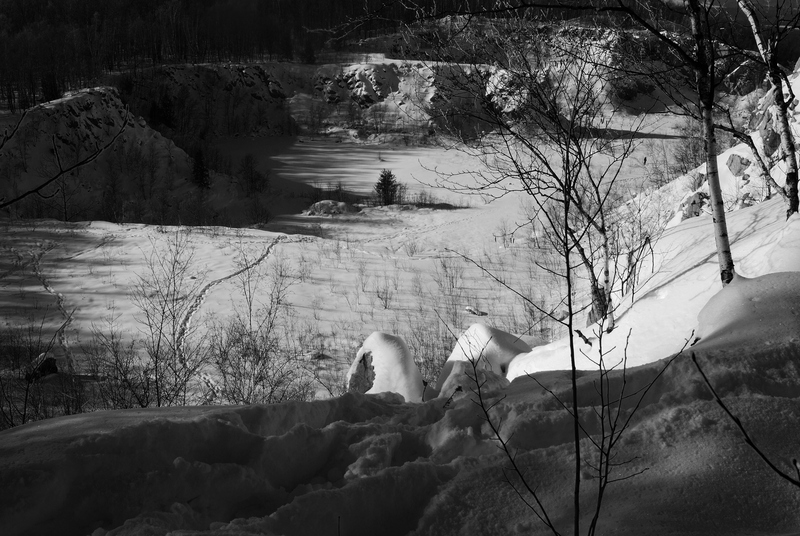 The quarry takes on a different look with each passing season. 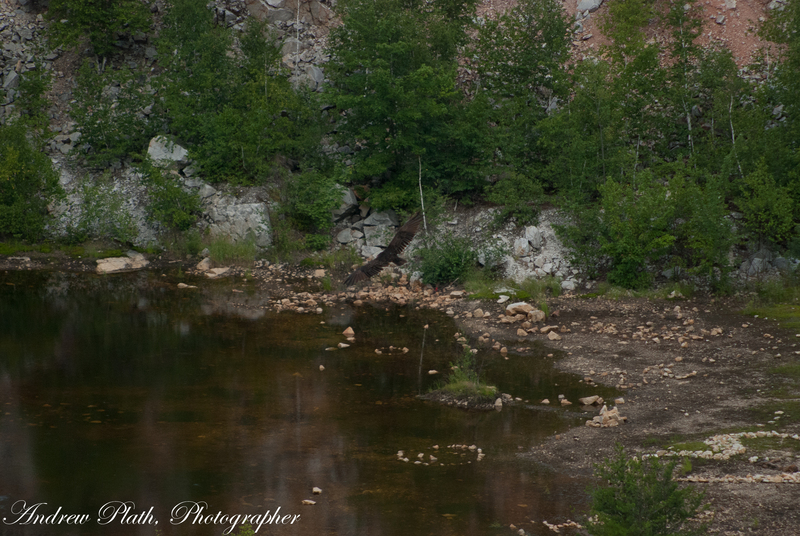 The rocks reflect different hues and the water levels in the basin change with each season. 3M’s mining trucks no longer rumble up and down the haul road which remains as part of the Turkey Vulture Trail. The rocks now sit in silent witness to changing seasons. 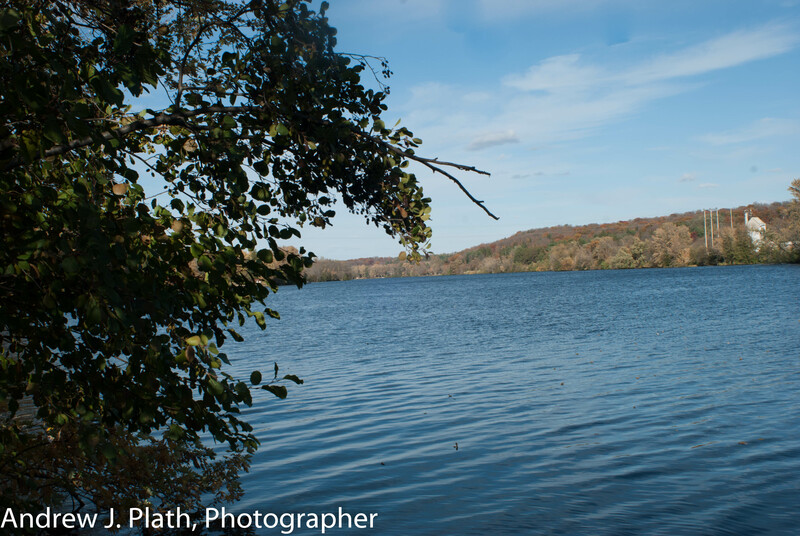 From Lac View Dessert on the Wisconsin – Michigan border to its meeting with the mighty Mississippi at Prairie du Chen, the Wisconsin River is always flowing. The Wisconsin is a living thing that man has merely harnessed but never contained. 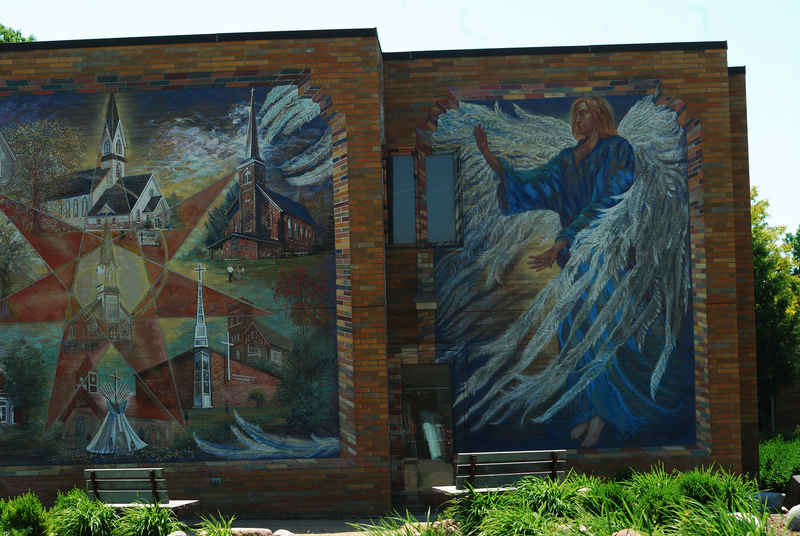 As it flows through Rhinelander, Tomahawk, Merrill, Wausau, and Mosinee, it brings to each community a sense of character and purpose. The river shapes the way people live in each community. 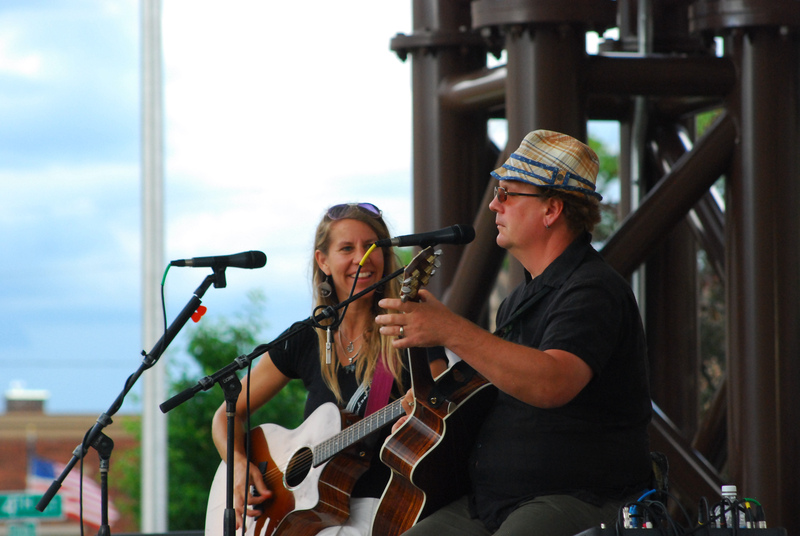 It makes Stevens Point special with its riverfront festivals. 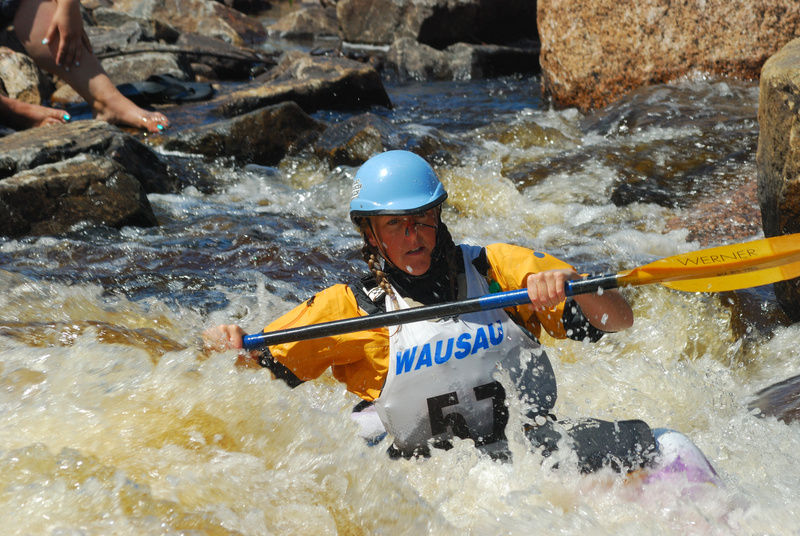 It draws international class paddlers to canoe and kayak competitions in Wausau. Loggers once used it to transport lumber to sawmills. Today the waters of the river flow through countless turbines to make the electricity that powers this man’s computer. 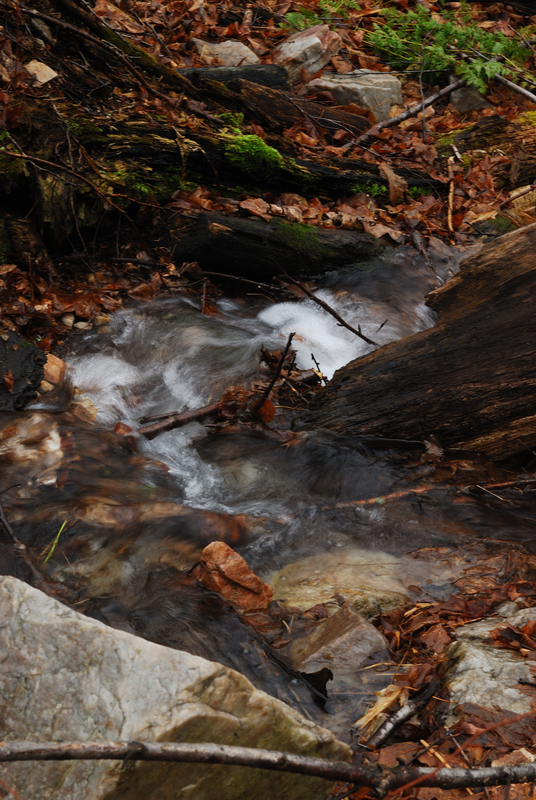 It is constantly flowing, constantly moving, like the stream of time since the dawn of creation. It brings wildlife into the cities, and along with it, the thrill of the spring walleye run. If you live along a river like the Wisconsin, it is a part of your life. A long time ago, when my father gave up on roses, he set up the perennial bed in that spot in the garden. 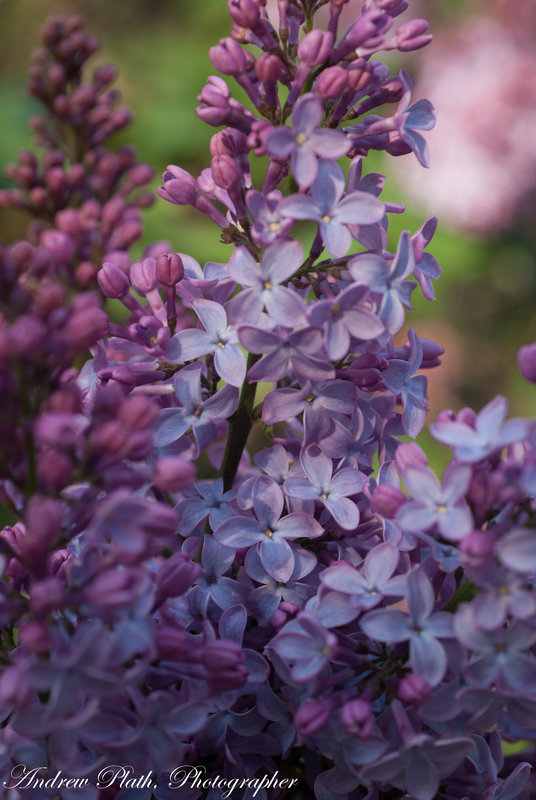 It is an amazing chorus of color that comes alive each spring with each species blooming in sequence as if there was one conductor orchestrating the whole thing. 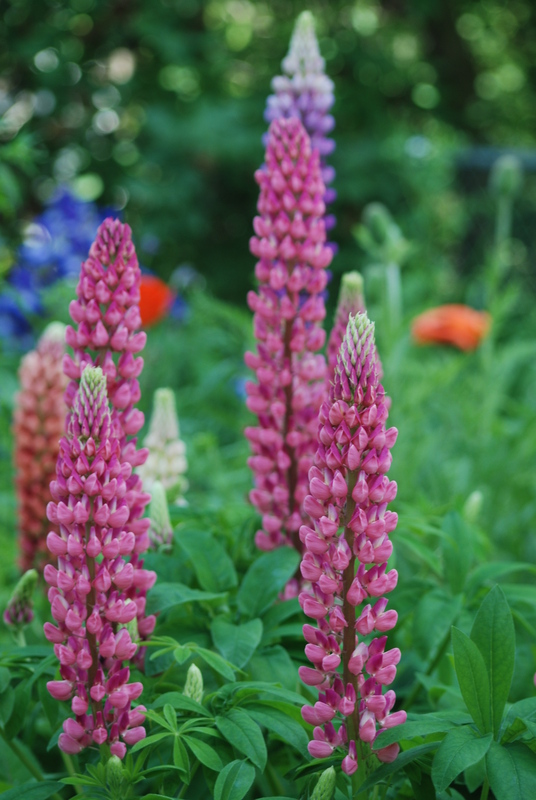 The lupines with their spikes of color are just part of that sequence. I now work hard to keep the flowers blooming, keep the weeds in check, and to keep this space as a garden of peace and solitude. The Lord God does the rest, and the result is magnificent. Spring time means many things to me. It means the warmer weather that is just around the corner. It triggers memories of the happy times of the past when the snow was gone and kids could look forward to summer and the freedom that comes with it. 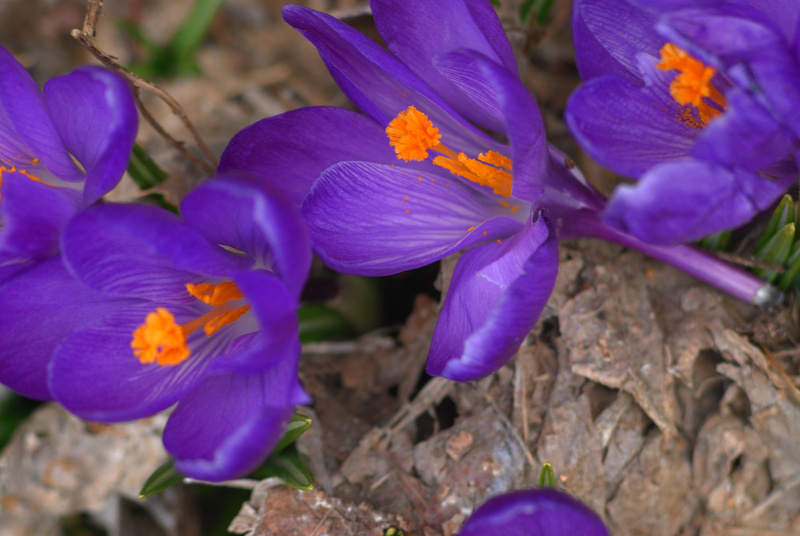 Springtime means growth and rebirth. The celebration of the Resurrection of our Lord comes in spring with renewed hope. 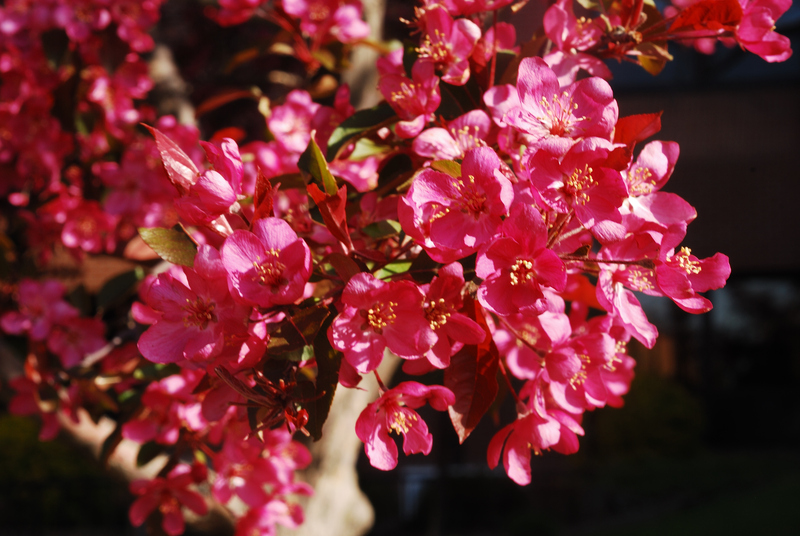 My neighbors had an apple tree growing in their yard that blossomed just in time for the backyard picnics and for Confirmation Day. The perfect backdrop for the family gathering. That tree is gone now. I sort of replaced it with an evergreen. A balsam at that. That tree is a living gift from a now sainted aunt of mine. These blossoms are from a tree growing on the south side of a place of worship and a place where I like to be gathered with my family to worship the Creator, Redeemer, and Holy Spirit. I have what some might call a multicolored flower garden in my back yard. This was a lasting gift from my Mom & Dad to this place. What had previously been a rose garden is now a patchwork of many colors, hues, and shapes. It is a genuine tease for my eyes, and for anyone who visits this place. Right now, if you came to visit me at my house, the back yard is the first place I will take you too. 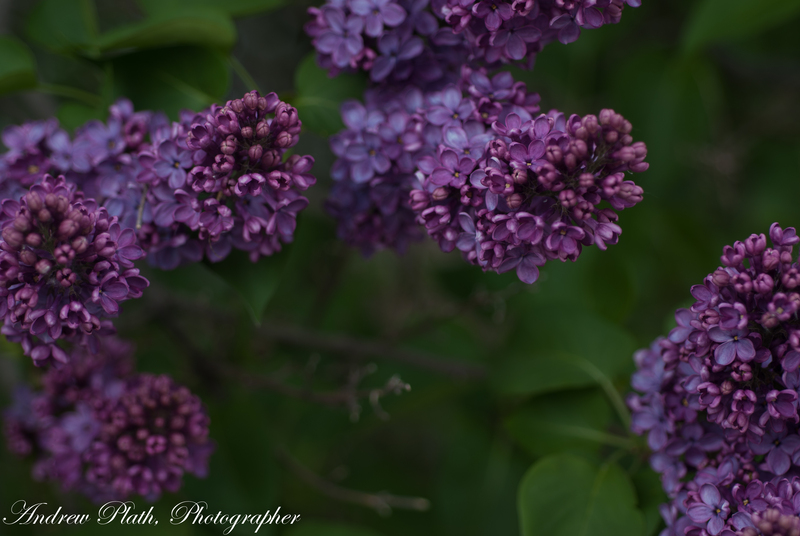 It is almost automatic in which these flowers and bushes come alive each spring. The yard is small and is dominated by both the garden and two now towering balsams which provide for plenty of shade and shelter from the morning sun. 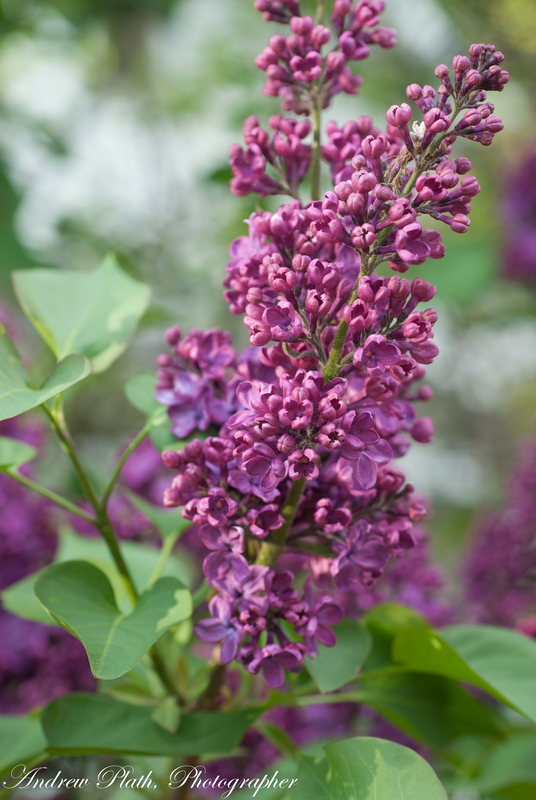 It is so natural and requires little work other than an occasional weeding to take out any undesirables. This was something that my dad had planned for back in the late 1970s. 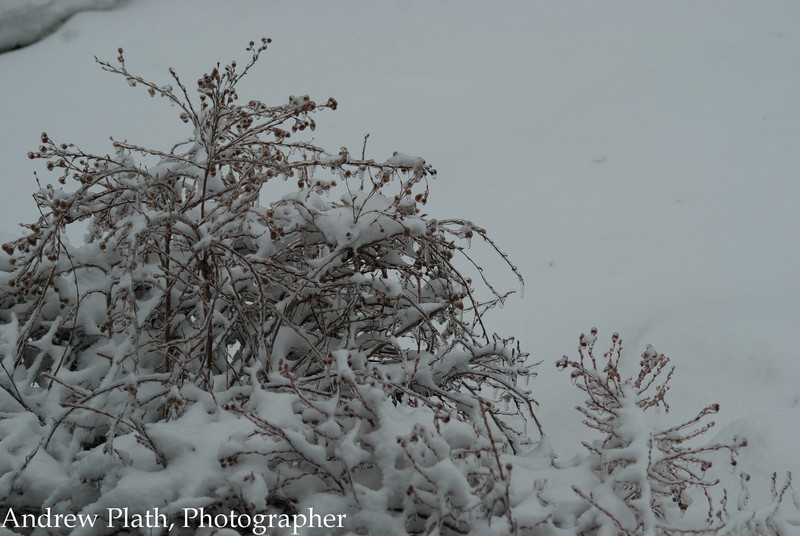 The Roses were nice, but they are more subject to freezing and thawing than other perennials. 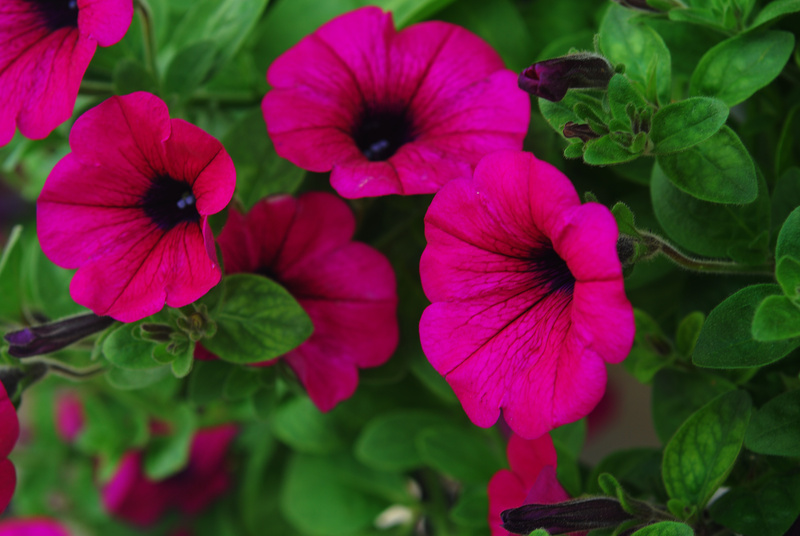 Some perennials generate from their own seeds. Others come from their roots. Its all natural. Yet while my earthly father planted the original seeds, etc, my Heavenly Father continues to make things come back each year. 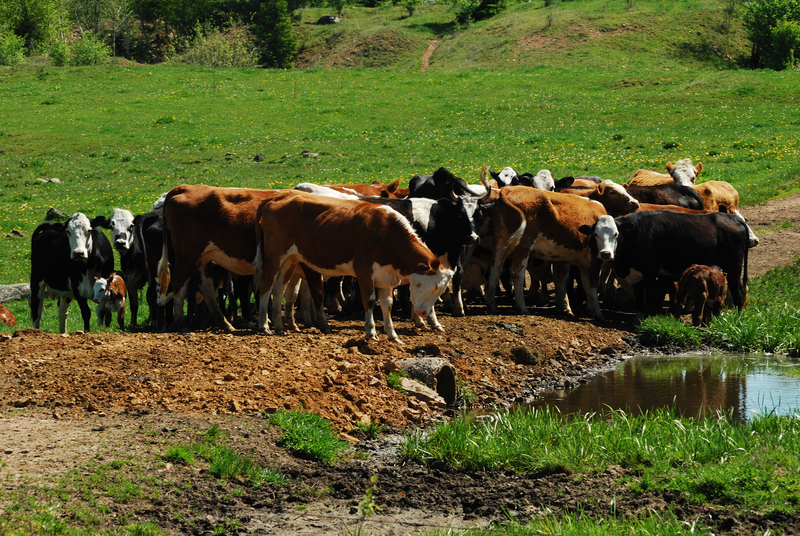 A gathering of cattle each taking there time at a watering hole. It is amazing what you can see on a ride through the country in Central Wisconsin. 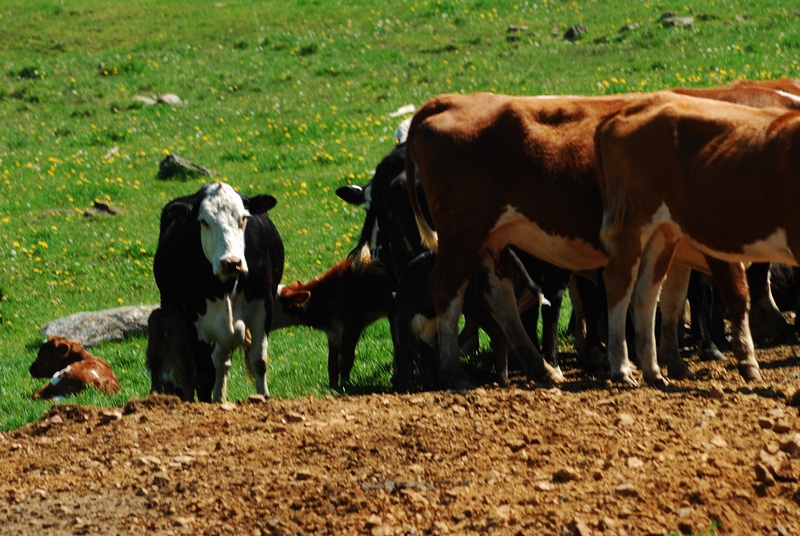 Dairying and Beef are big things in Wisconsin. 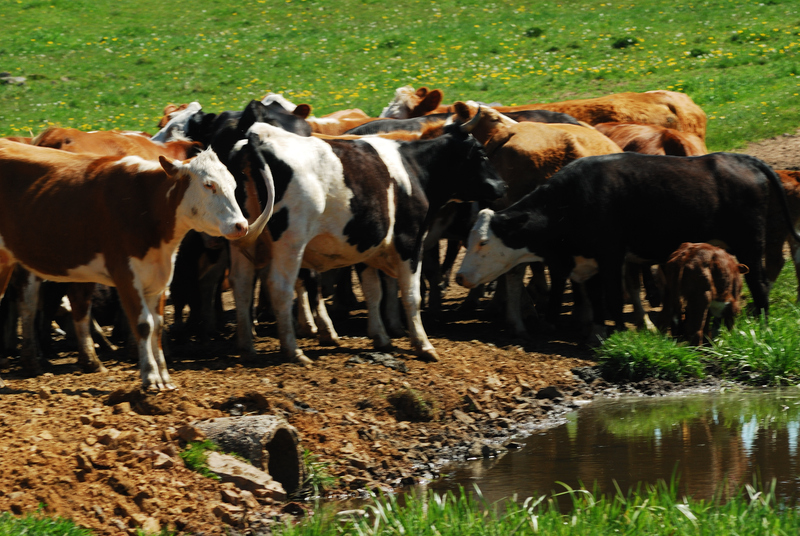 So the site of cattle is a common thing. With these sites and sounds, you know you are in the country. 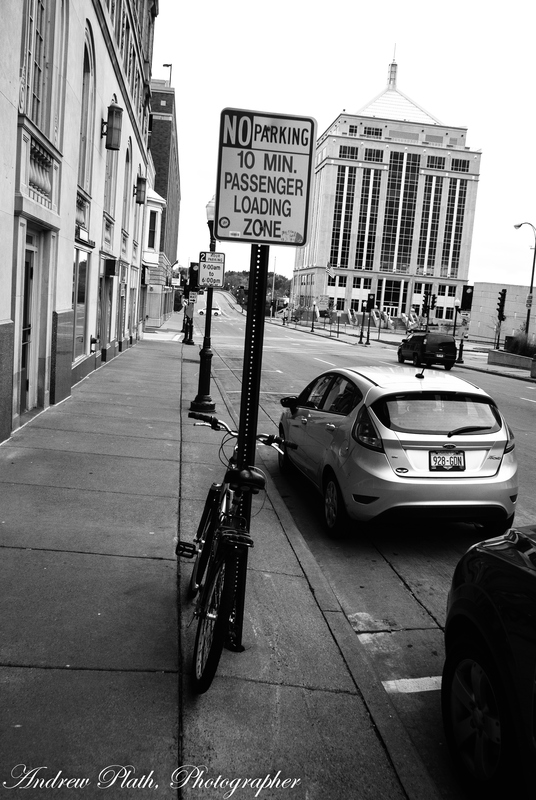 Sometimes taking a camera along on a bike ride can bring in images like this. On many of my bike rides, I often get absorbed into the scenery. This gives me time to meditate, to pray a little, and basically praise my Creator for even the smallest things. Sometimes the best parks are the smallest. 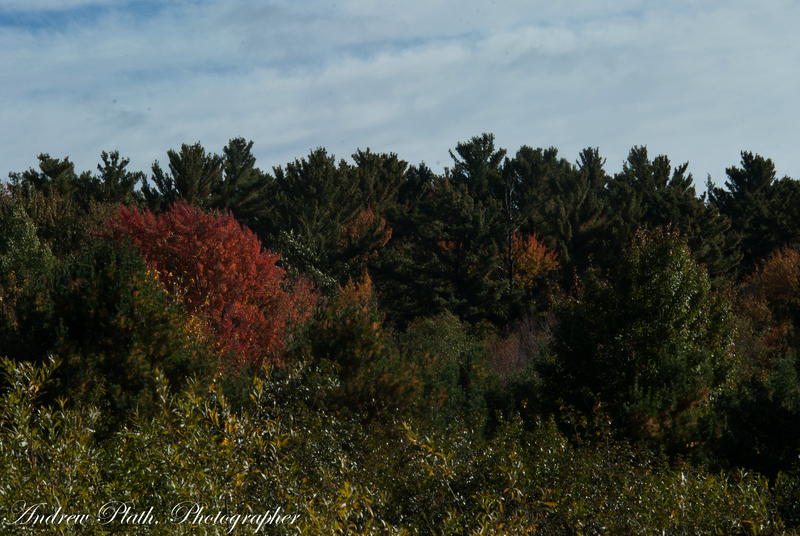 This was taken from the banks of Big Sandy Creek just off of County Highway J in eastern Marathon County about 5 miles east of Wausau, WI. This is a wayside park off of County Highway J just south of Sunset Corners. We need tiny little places in our lives to deal with all of the hubbub. I look for these places. These are the little gems in the State of Wisconsin. Who Says Winter is Bad? 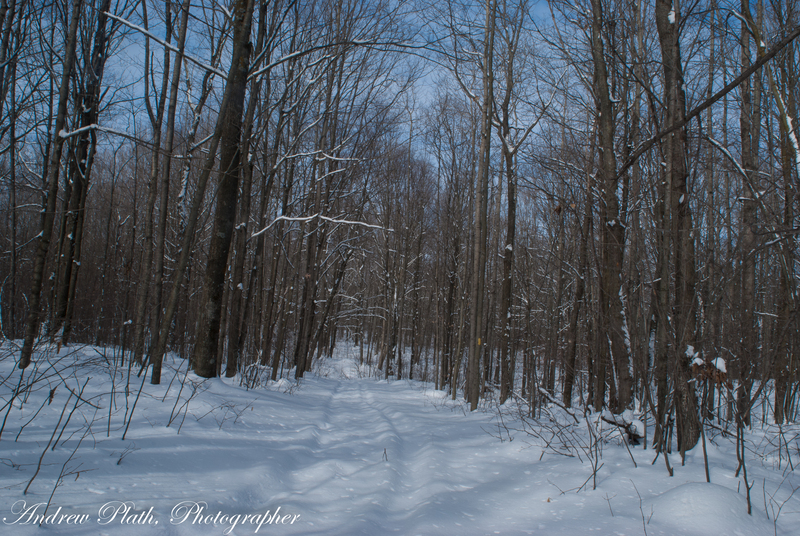 I was originally going to hike the newest segment of the Ice Age Trail near Aniawa on the day that I took this. I realized that a Dodge Avenger wasn’t an SUV and I could not push a button and have it instantly turn into a Caliber or much less a Durango. I could not make it into the snow-bound lots of the Plover River State Fishery. So I made my way west on Sportsman Drive to find a more civilized place to park after having a friendly guy with a pick-up pull me out and nearly getting stuck again while trying to park on the road. While driving westward on Sportsman, I was surprised at this cut-through. I was still in the hummocky land of the Ice Age Trail full of kettles and moraines. Yes, this is the terminal moraine that covers much of northern and eastern Wisconsin and even as far south as Baraboo where the hills meet the coulee region of Wisconsin’s southwest. 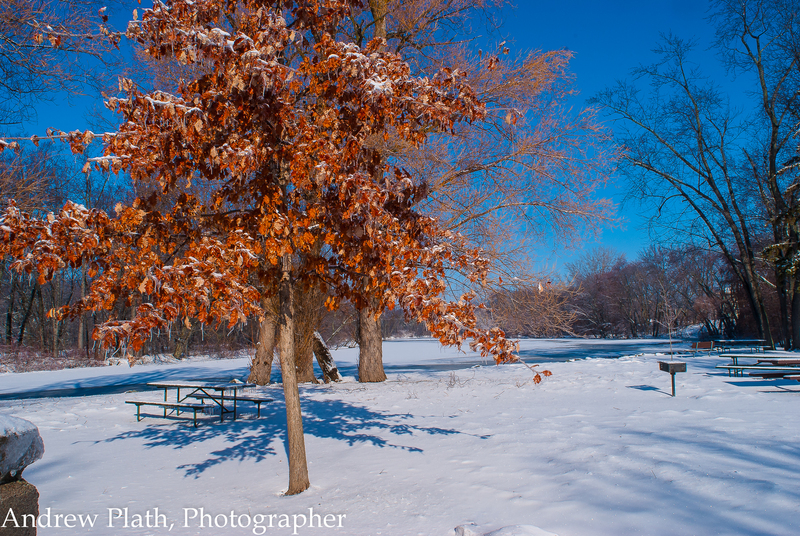 The crispness of the air in Winter makes for great outdoor photography anywhere in Wisconsin. 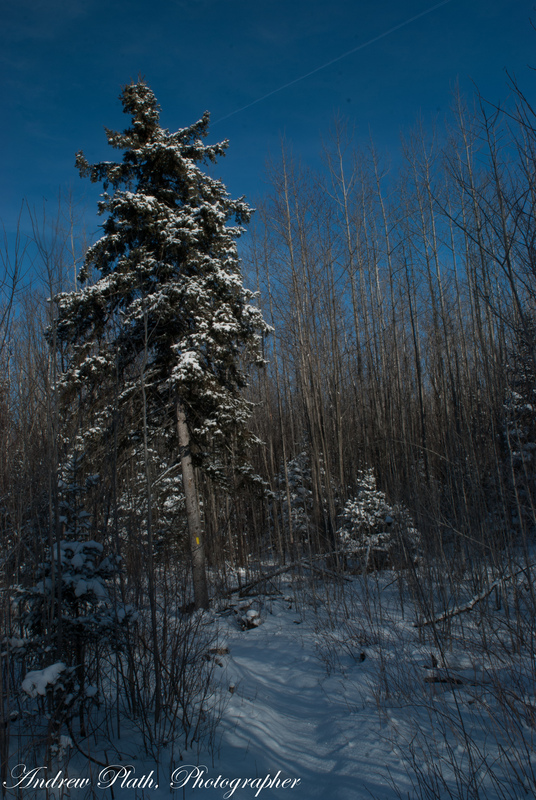 Cobalt blue skies combined with evergreens and the whiteness of snow add to the color that makes winter what it is up here. It is fresh and pure. Yes, some people complain about it and long for the warmer seasons to come, but I am not one of those. If anything I complain about all the seasons being too short. That is just because I want to enjoy all of them. I tell people that, if winter gets them down, then the right thing to to is just get out and enjoy it. Even in winter there is warmth. When the sun shines on snow, it reflects back upward. I feel the warmth on my face. I feel it on my back through my winter jackets and all my layers. Its there. Oh what a wonderful feeling! 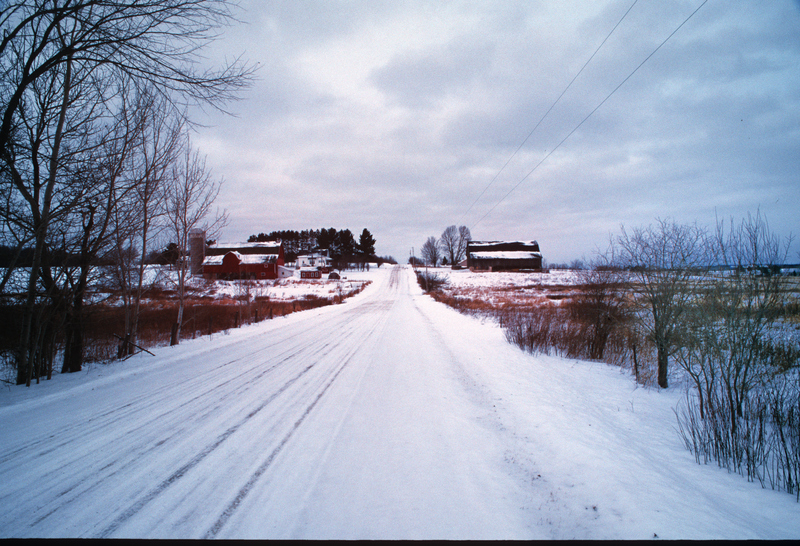 Growing up in Wisconsin, I learned to appreciate the seasons in the country . We have much to be thankful here and giving thanks should never be relegated to just one day . We can be thankful along with the farmers for the food that graces our Thanksgiving Day tables. We should be thankful for decent housing and income. I thank the Lord for creating all things. I thank the Lord for the sunshine. For making things grow. For caring people ready to share the Gospel to those that society often rejects or has no place for. Most of all, I thank the Lord for taking our place on the cross making possible a victory that we could have not won! The small farm on a hill. 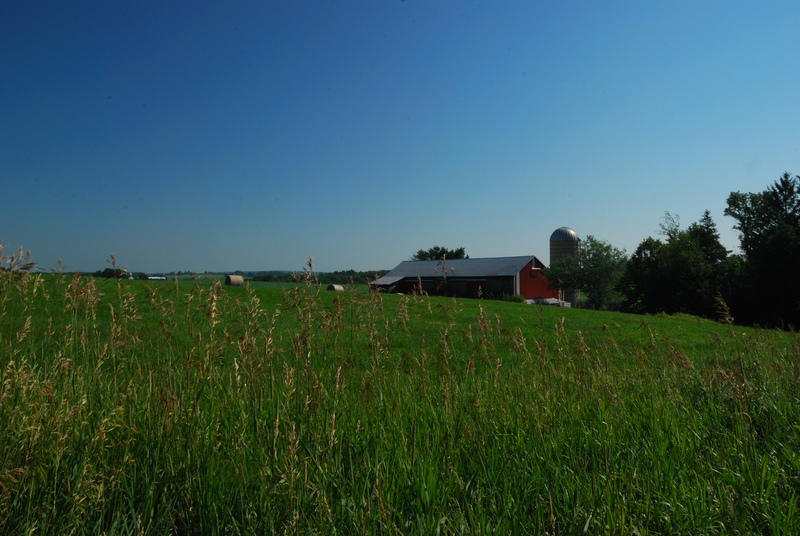 Once upon a time, a family in Wisconsin could raise a family on 40 acres and a few cows. My work with the Wausau Blind Outreach Center has put me in contact with older people who live on small farms like this one. I admired its location. I wanted to get an image of the farmstead at sunset. 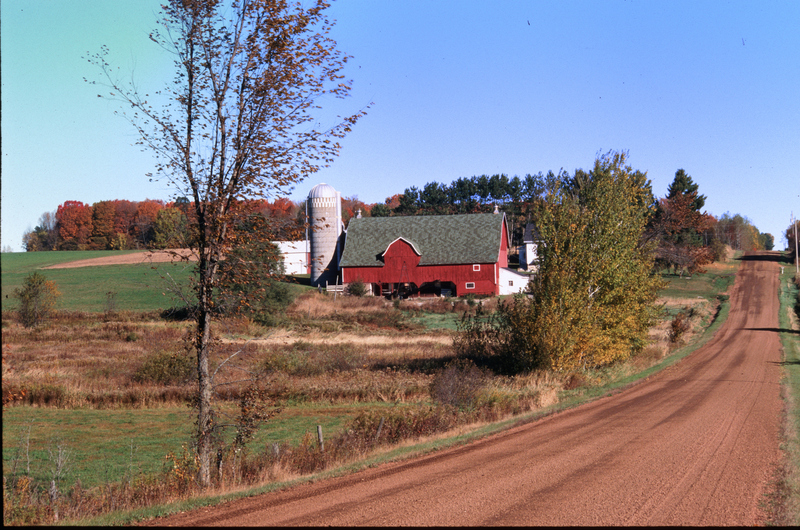 This farm, recently owned by Gilbert and Francis Jacobi, intrigued me so much that every time I rode bike out northwest of Wausau, I tried to figure out where I could get the best view of it. I looked at a vantage point along County Highway U which was looking up at the farm from this same angle. There was too much traffic, and a high-voltage line really messed up the view. A view from Decator Drive, one mile further to the north might work. So I ride out on Decator, climb the hill west of 44th Avenue, and I found this clear shot. I check the time and find out when the sun will hit this angle and light up the red barn! When I got out to take this picture, I put my D-80 with the 70-210mm tele-zoom fully extended (the sensor in the D-80 is smaller than the normal 24×26 mm film plain in a 35mm film camera so when 210 mm is multiplied by a factor of 1.5, its focal length is 315 mm.) 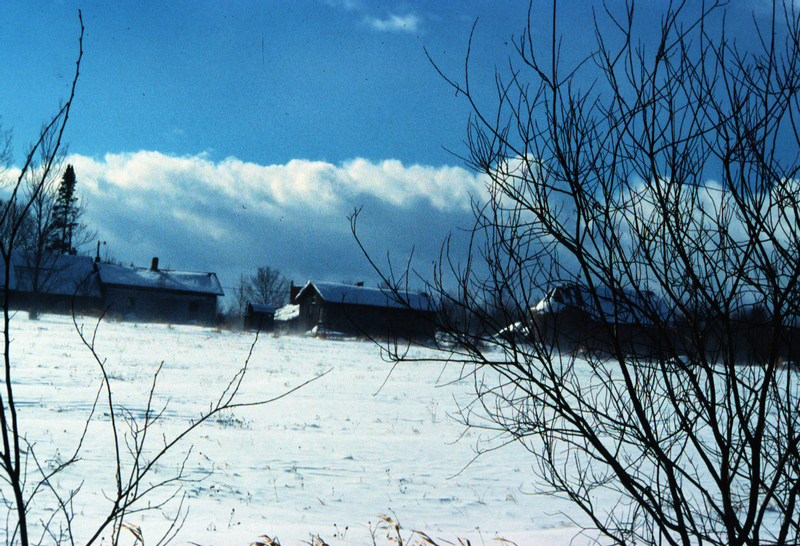 I carefully composed this image aiming the camera so to avoid the water tower immediately to the east of the farmstead. God is often at work here. I’m just the guy who loves to document what he sees. God made the light, the hills, the trees, and everything that the light reflects off of. I am thus moved by all that I see. The real wonder is that, when digital photography really started to take the place of film, people doubted that the colors in color photography would ever be this strong or whether the gray-scale in black and white photography ever be as intense. The fact is that the actually image that my D-80 puts on a memory card is so much larger than anything a 35mm film camera could produce. This image alone could easily be reproduced on a poster sized print with no loss in resolution and certainly no grain! God made this world, and he gave guys like me the tools to show his handiwork. http://wildlightphotography.photoshelter.com/gallery/Inspirational These are some of the latest editions to my sales sight. 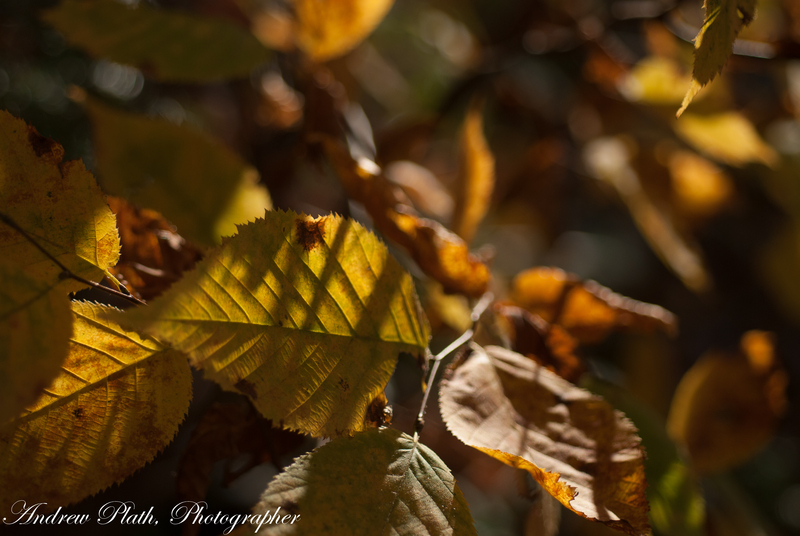 Autumn for me has always been a time when we mere humans seem to get a taste of God’s glory in nature. 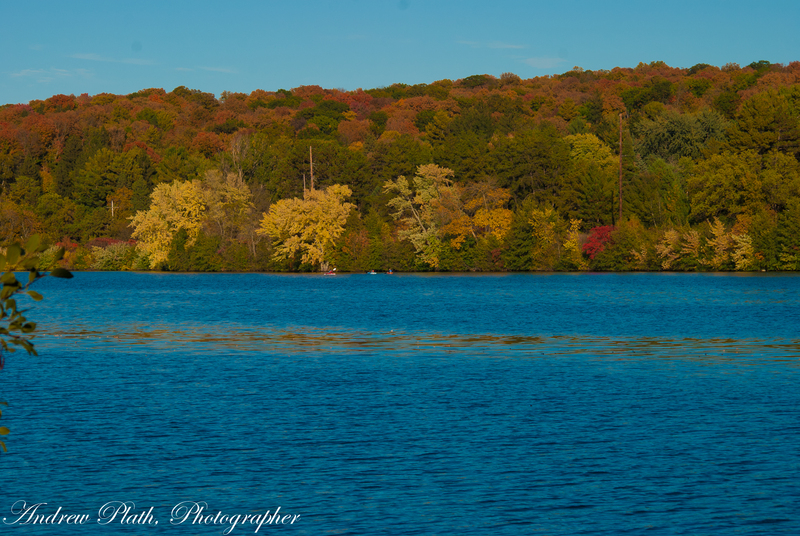 The hues are amazing right here in Wisconsin. 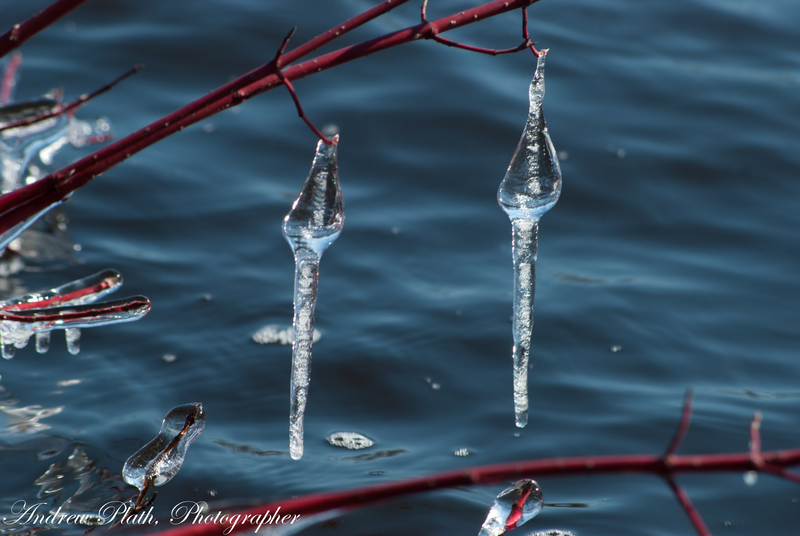 Many of my images were taken within a few blocks of my home here in Wausau. This blog will change from time to time as I have come to know how the slide-show feature of WordPress works. Yes, all of these images are for sale. 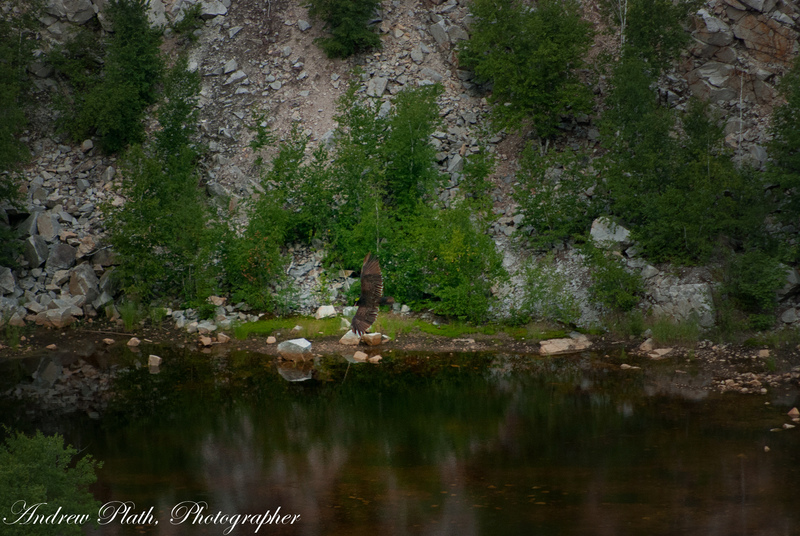 Just go to http://wildlightphotography.photoshelter.com/gallery/Inspirational and take a look at what you see there. Christmas is coming. 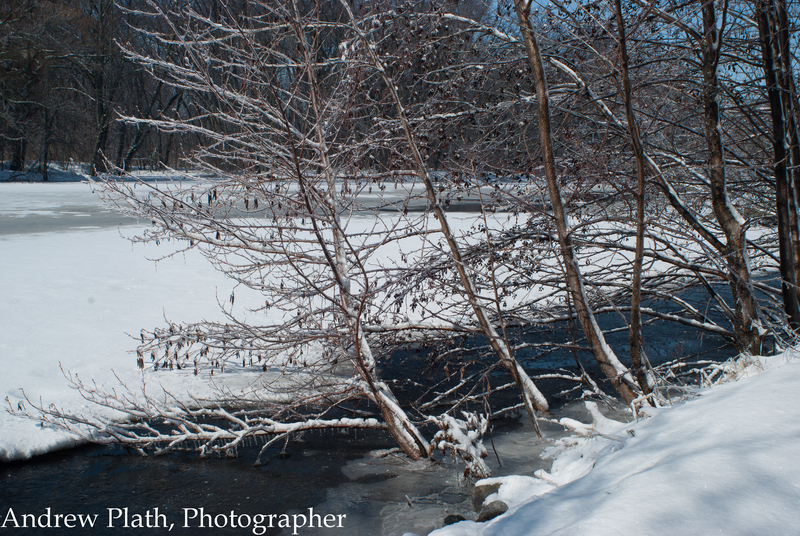 Each one of my images would make good gifts. I took a hike across town this morning just for some exercise on this warm autumn day. 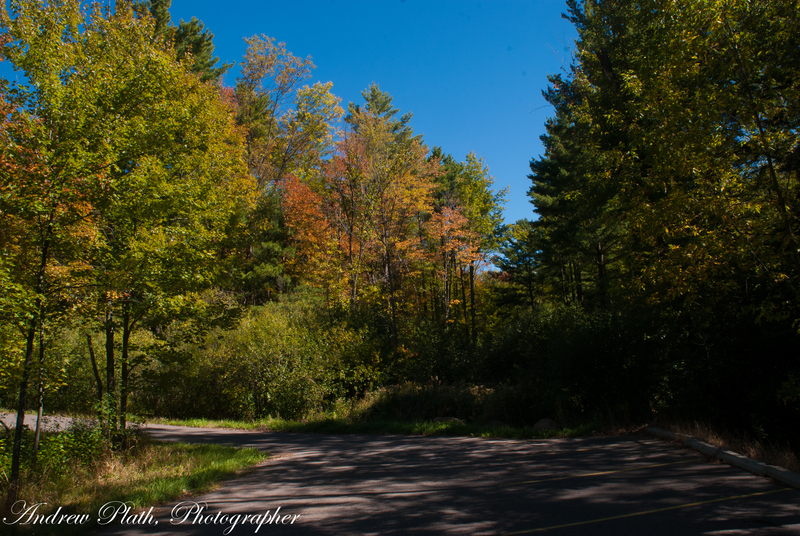 Wausau is surrounded by color in the fall with wooded hills on all sides. This makes for a pretty site to see in the fall. 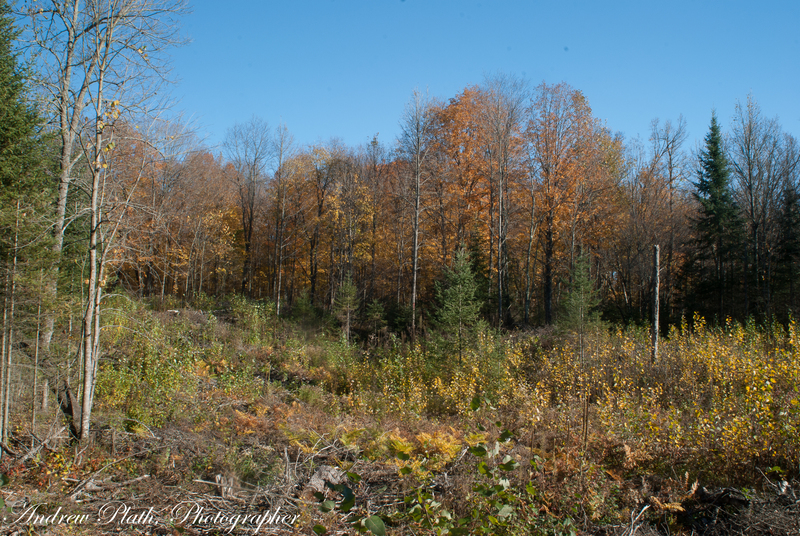 The Paff Woods is a part of that on a ridge on Wausau’s far east side and is a part of Wausau’s park system, so there is a network of trails. Compared to larger parks in Marathon County like the Big Eau Pleine County Park http://www.co.marathon.wi.us/Departments/ParksRecreationForestry.aspx and Rib Mountain State Park , http://dnr.wi.gov/org/land/parks/specific/ribmt/, both at about 1400 acres, this park is small. 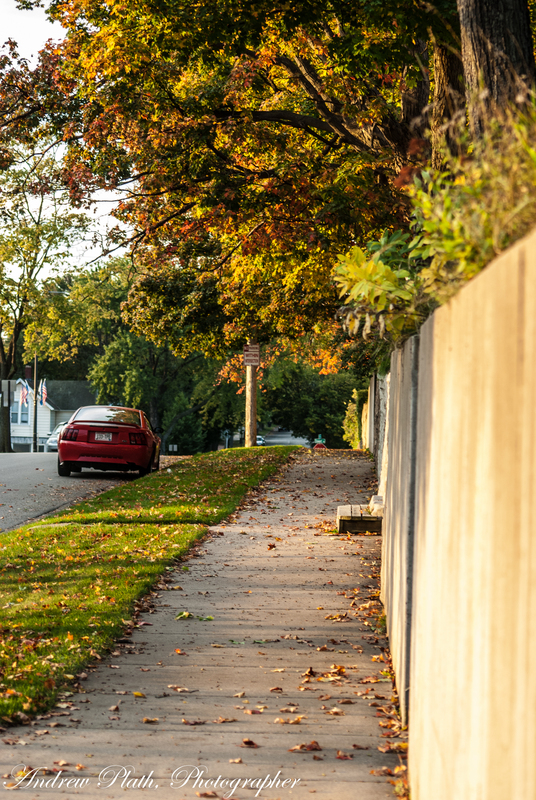 Yet it allows neighbors a peaceful place to get out, exercise, enjoy nature, and it allows elementary students at nearby Hawthorn Hills School to experience nature. I just had to get out and walk this morning and I knew my feet would carry me there. Sans camera, I knew I had images on file from this park. Good reason to write.